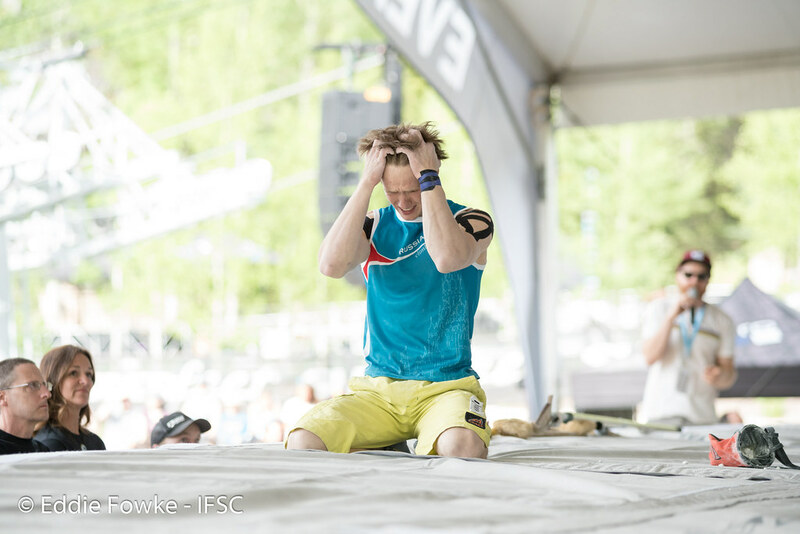 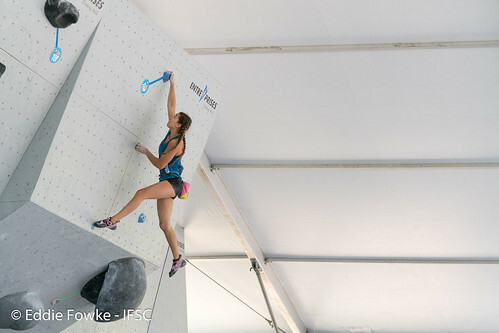 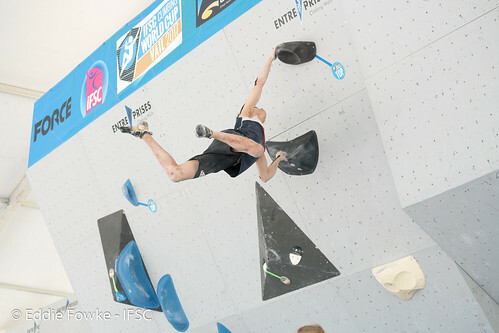 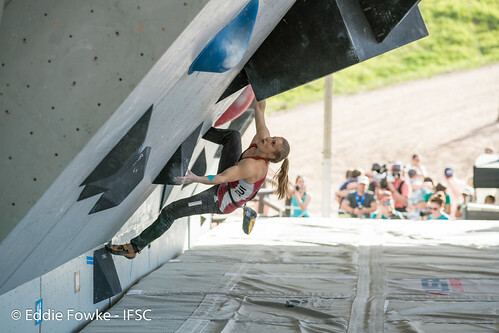 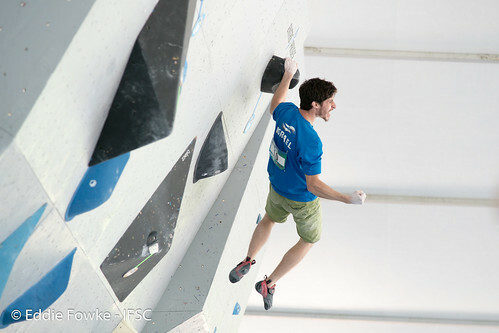 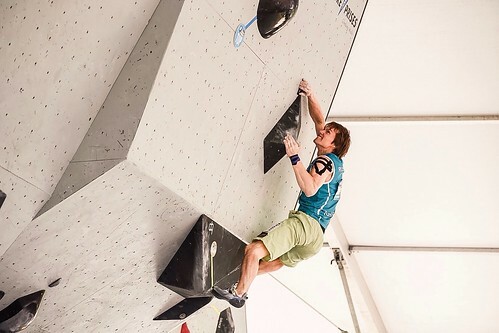 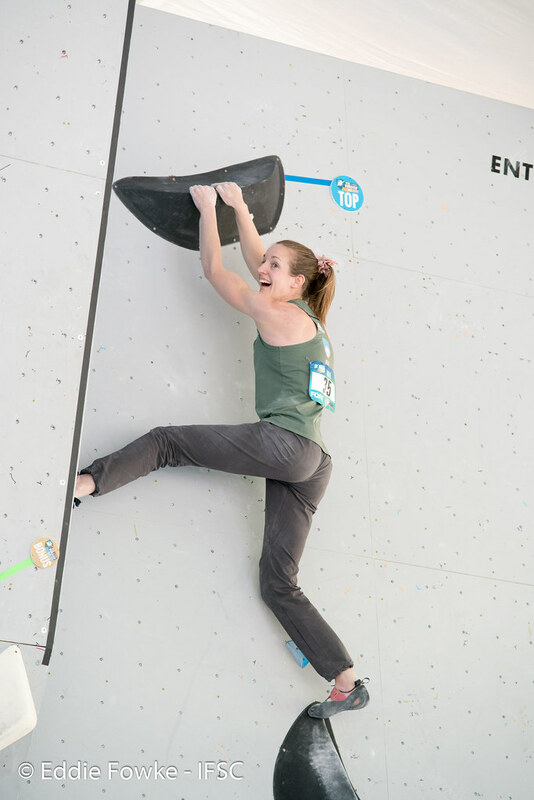 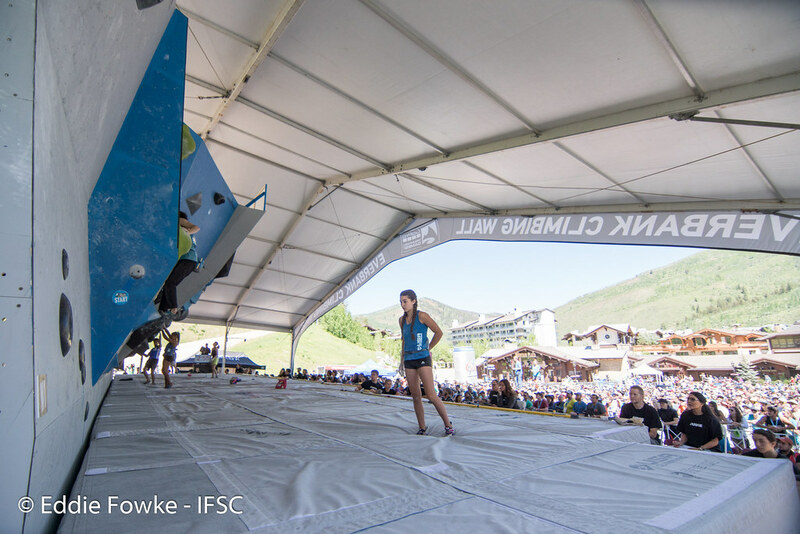 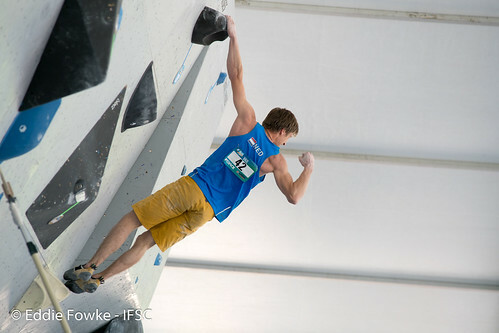 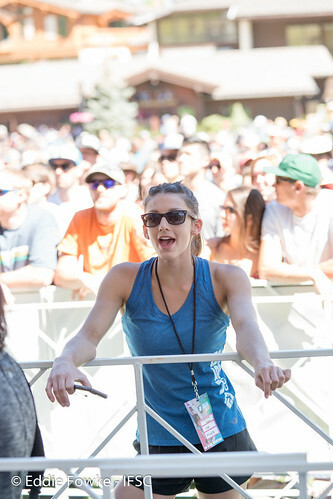 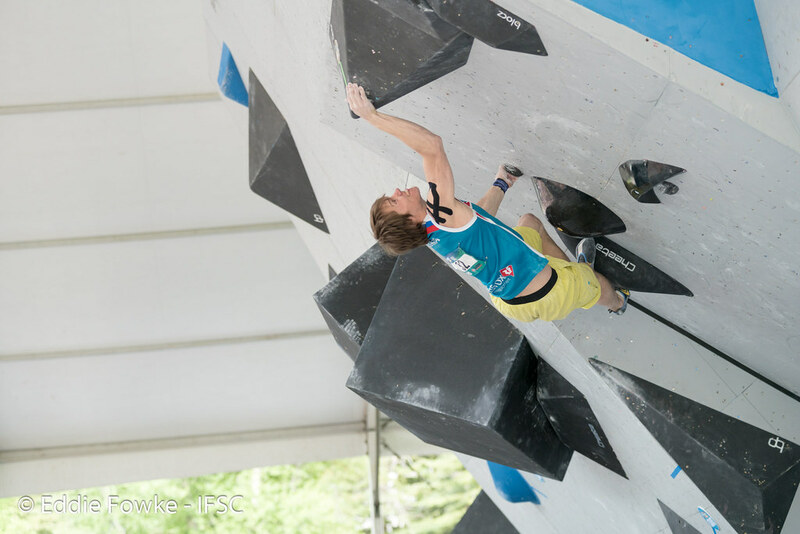 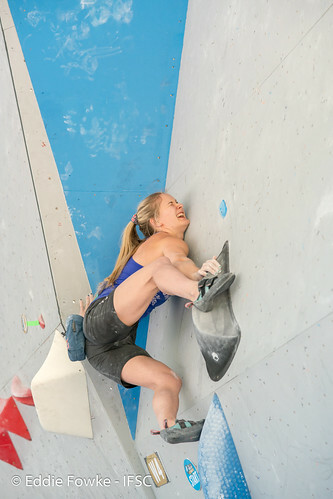 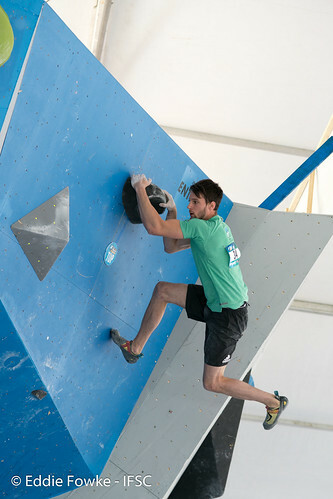 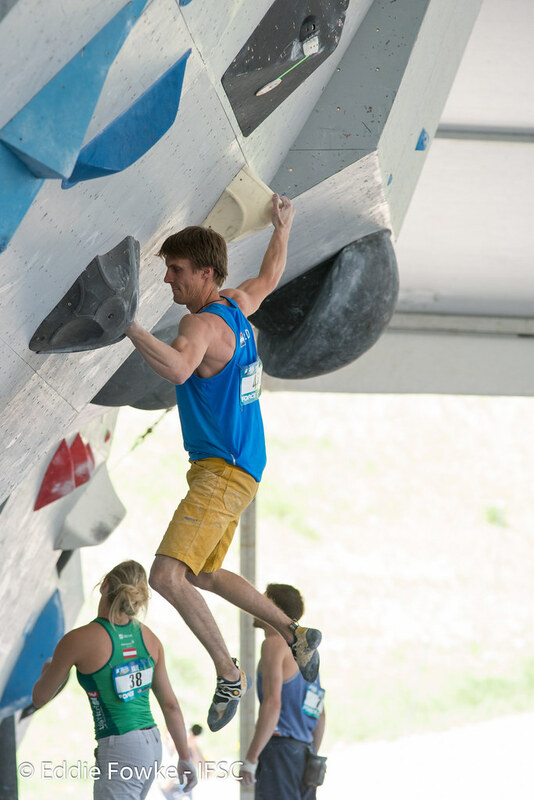 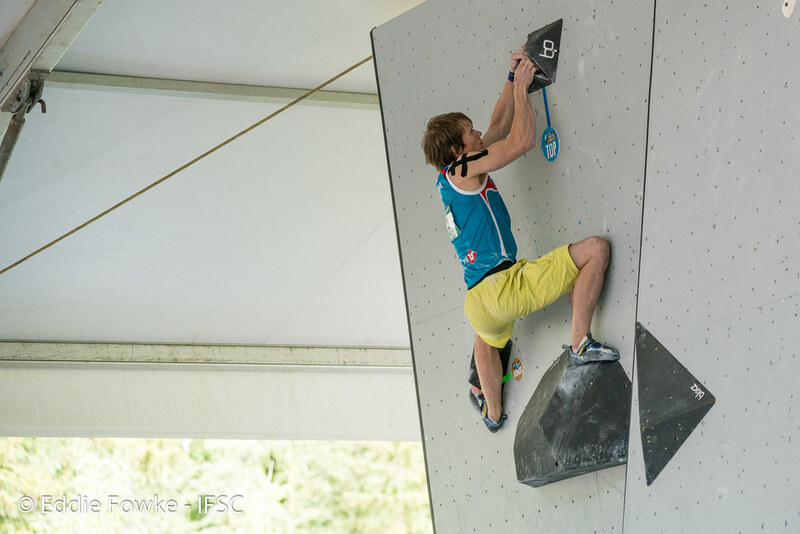 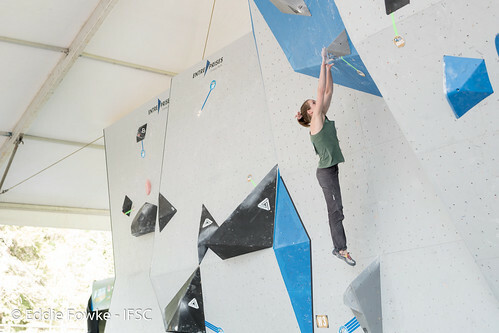 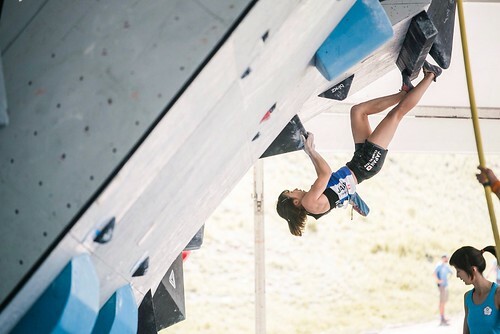 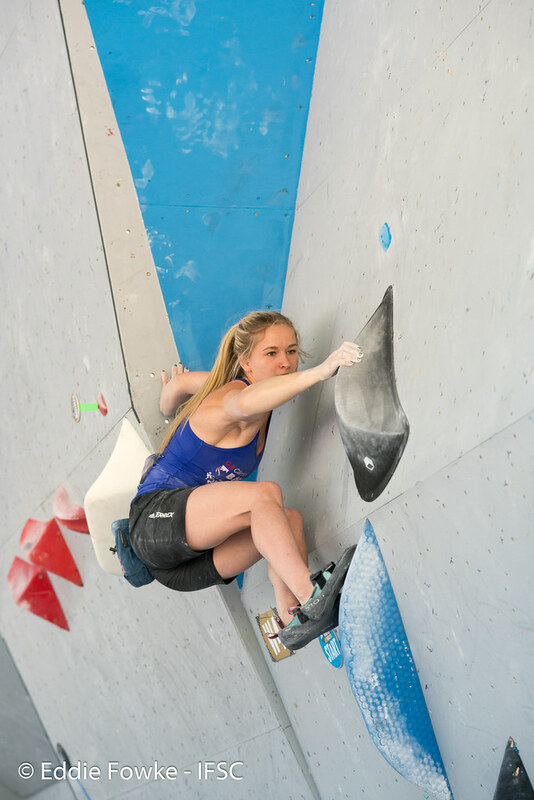 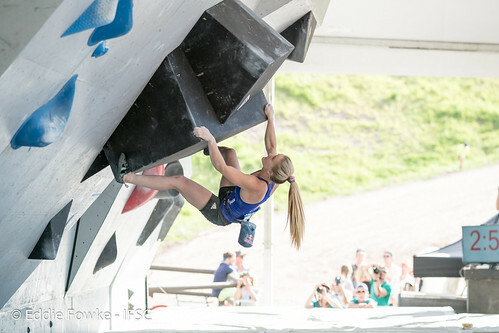 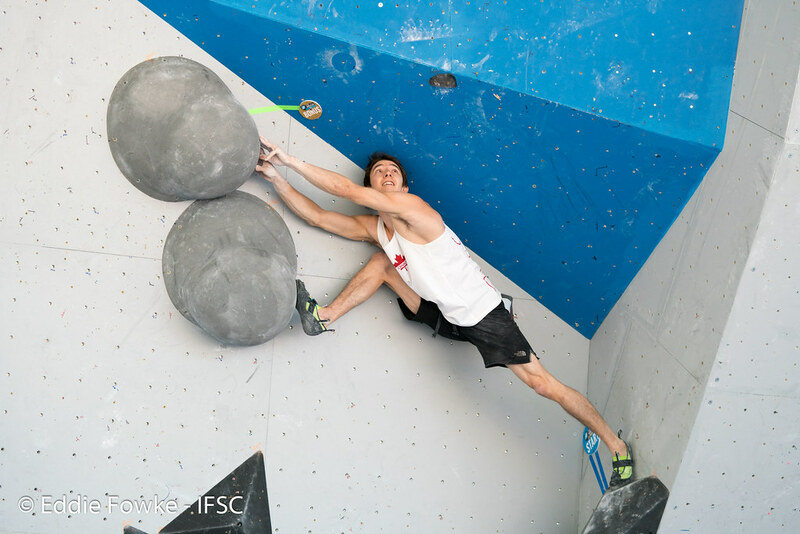 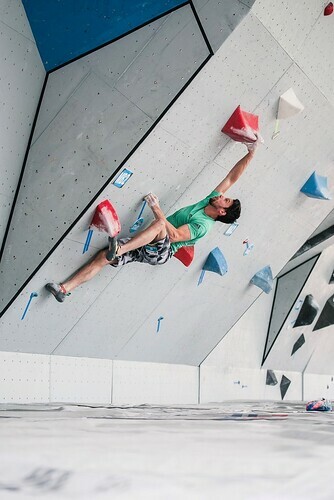 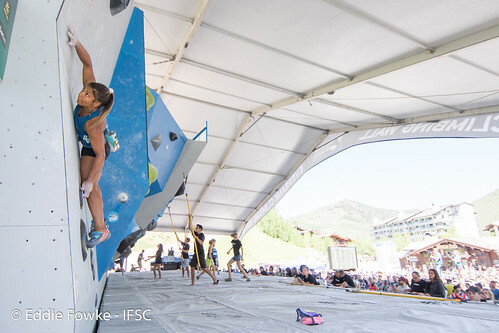 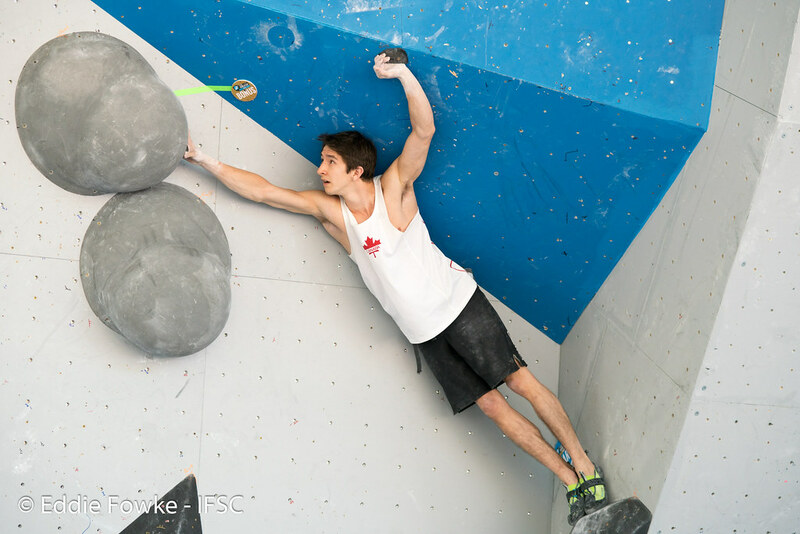 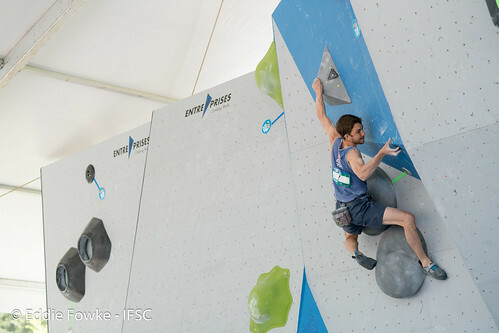 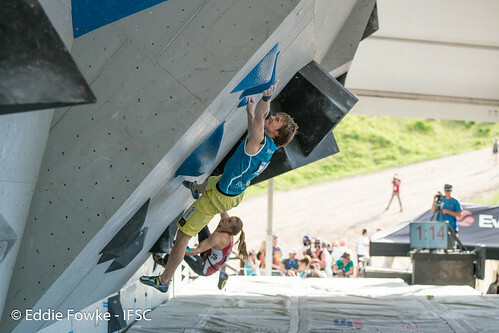 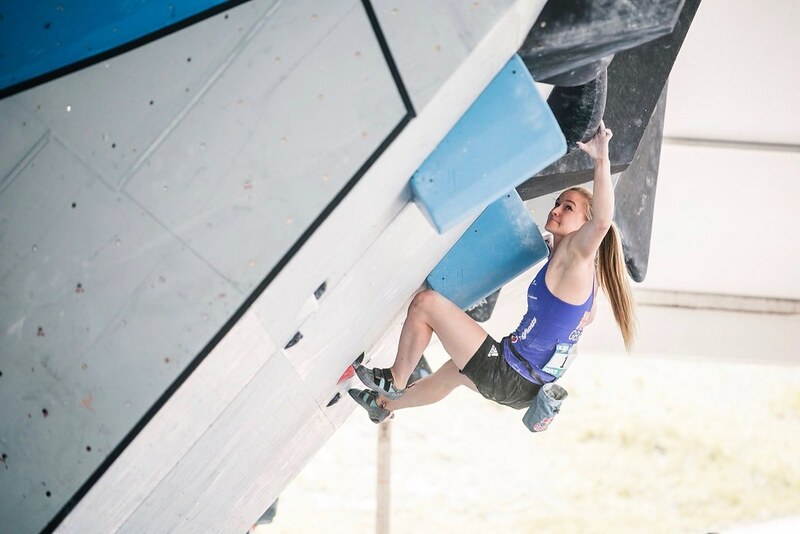 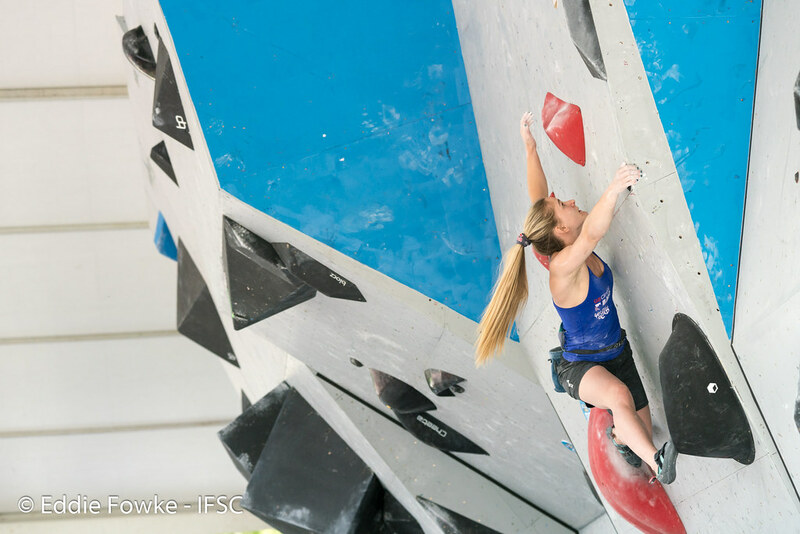 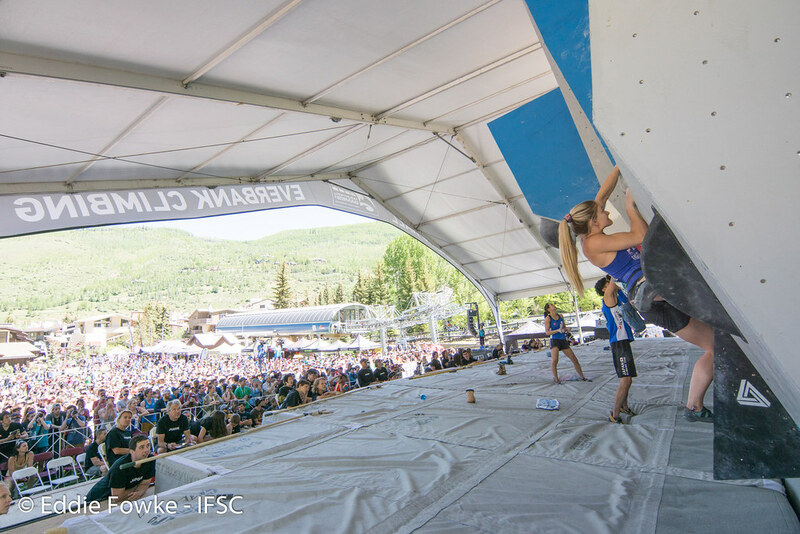 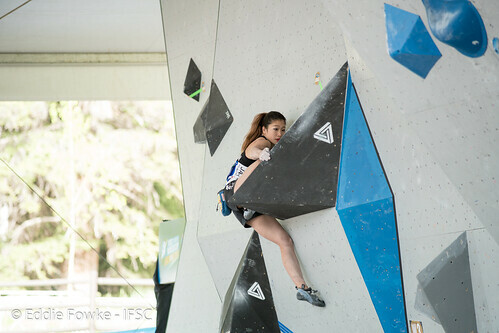 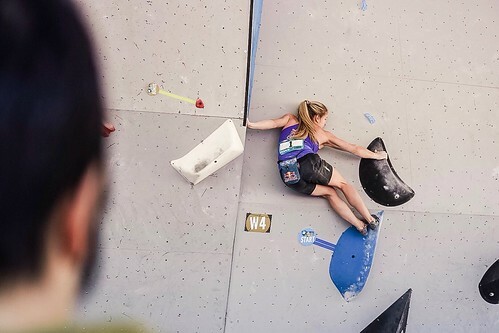 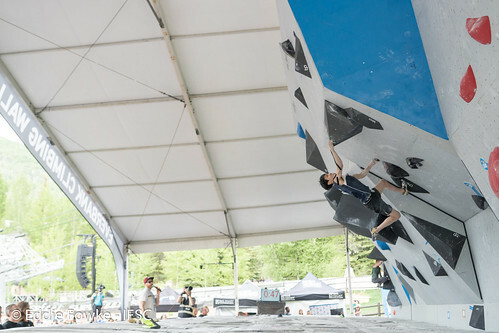 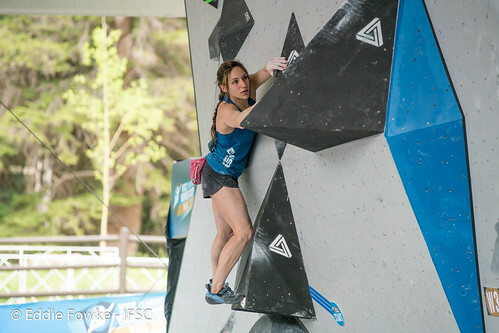 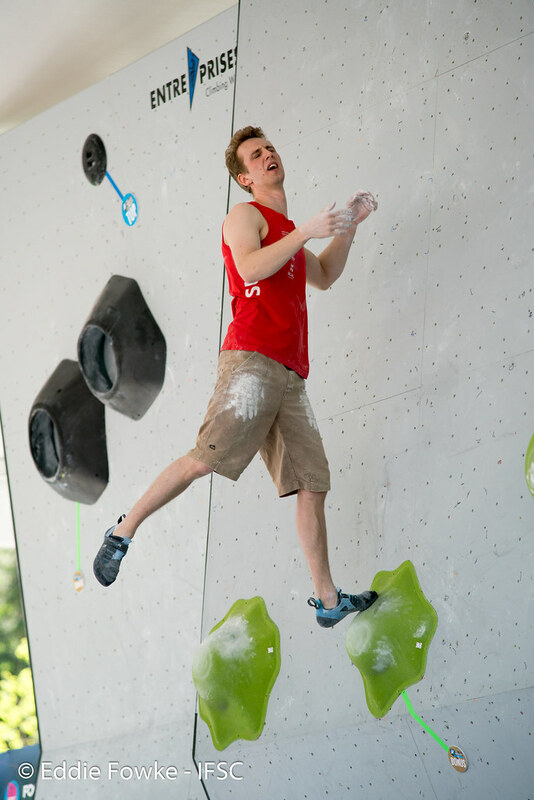 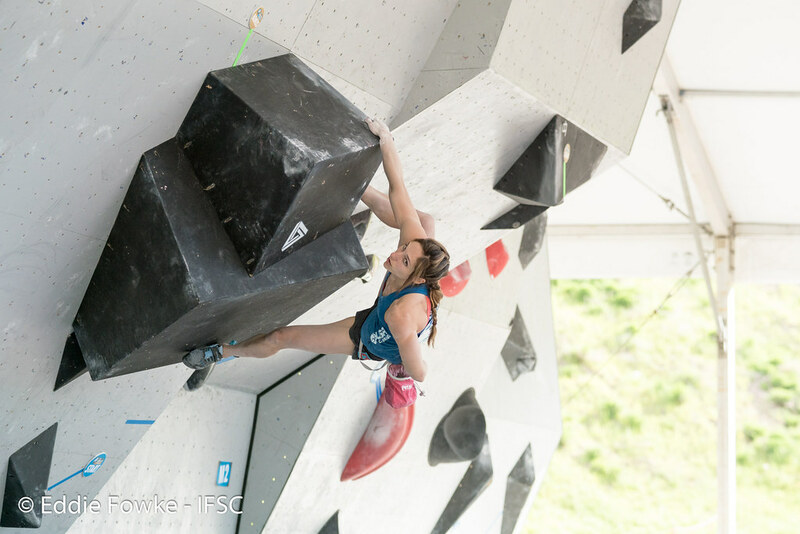 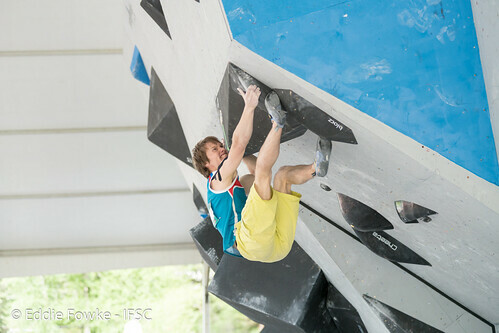 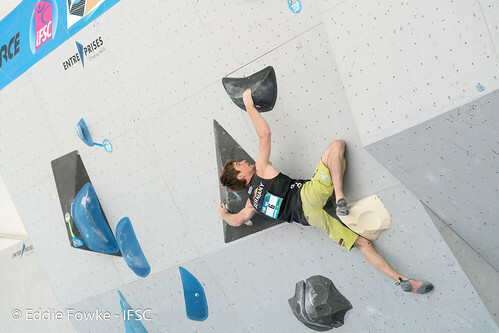 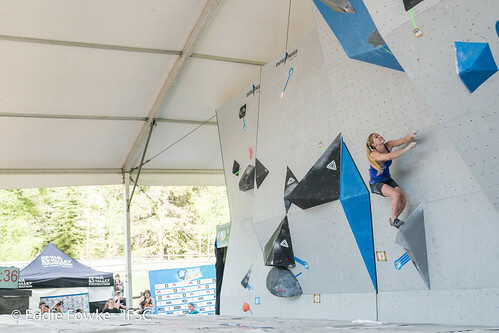 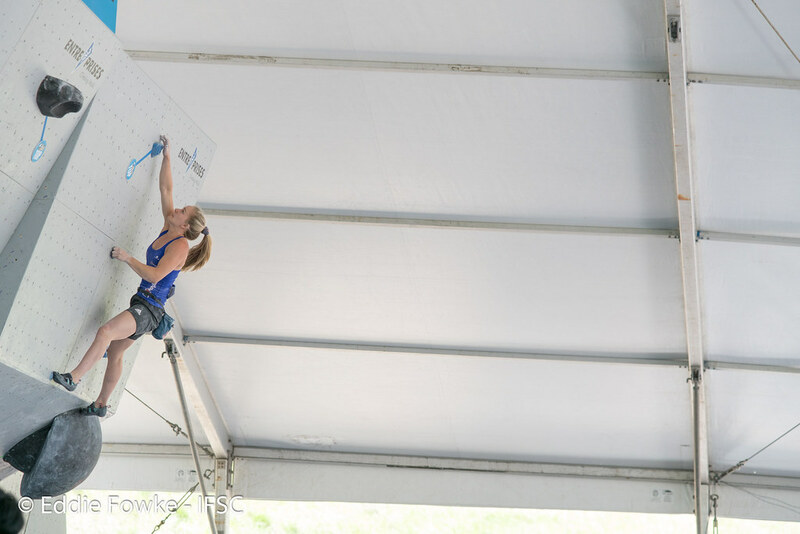 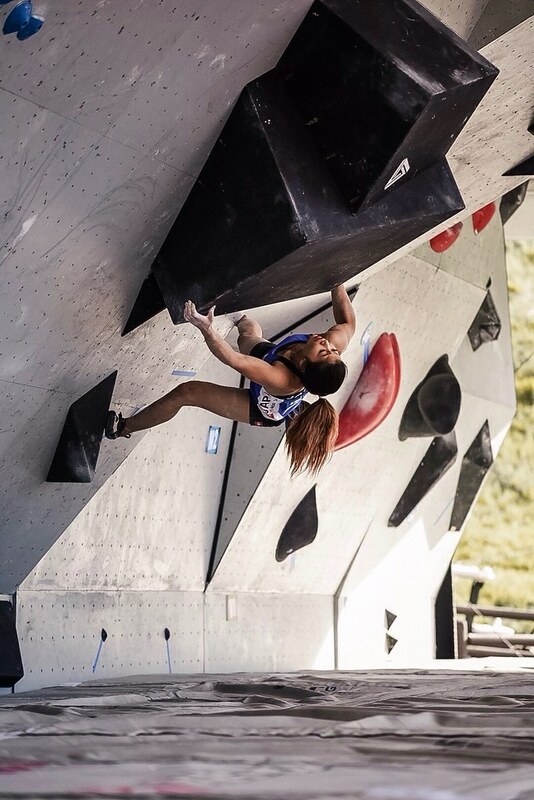 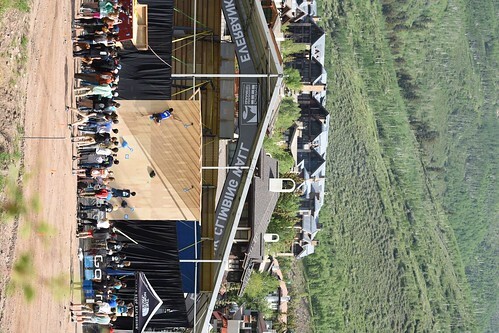 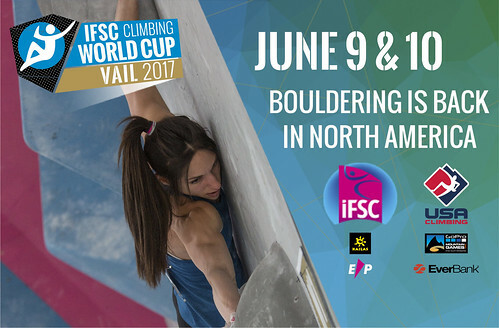 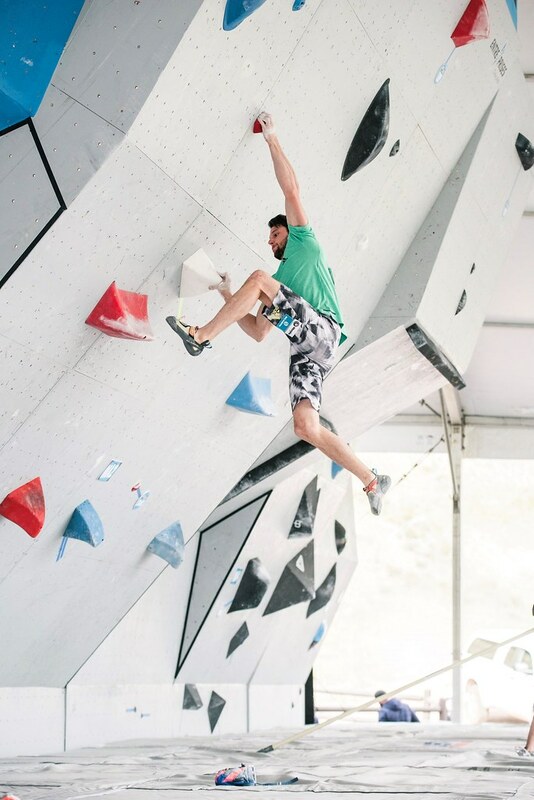 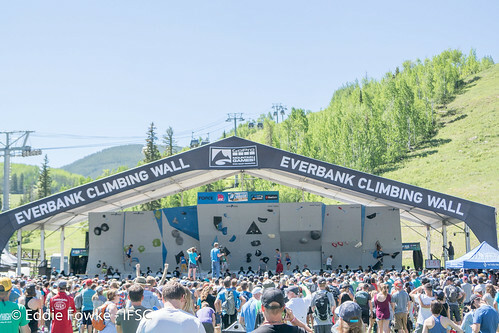 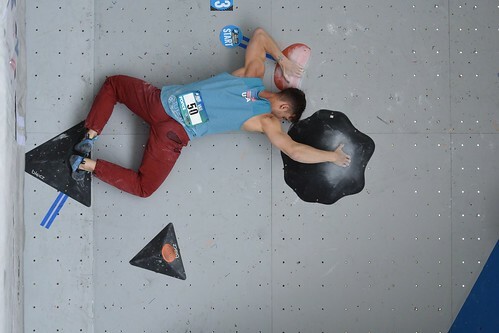 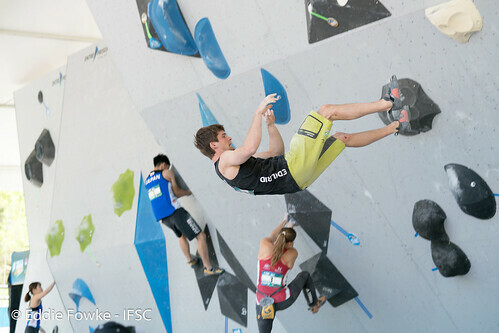 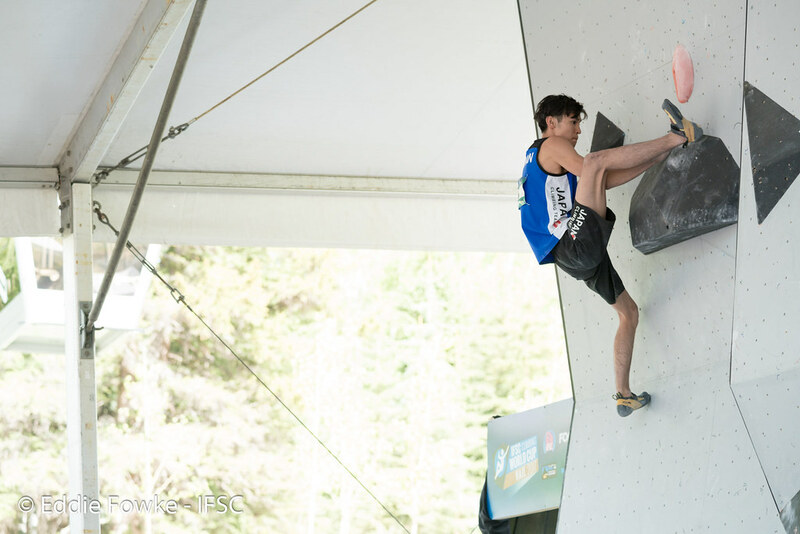 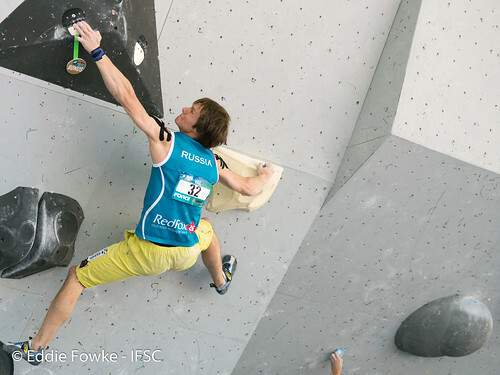 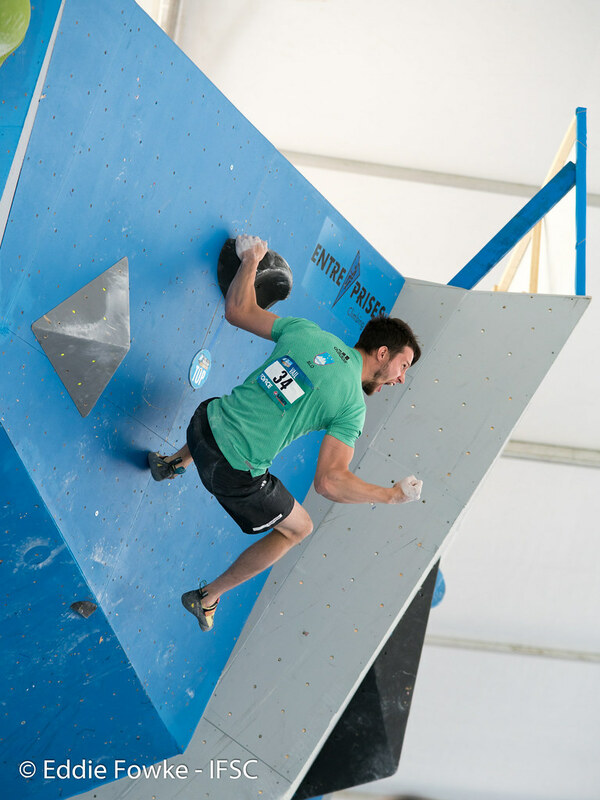 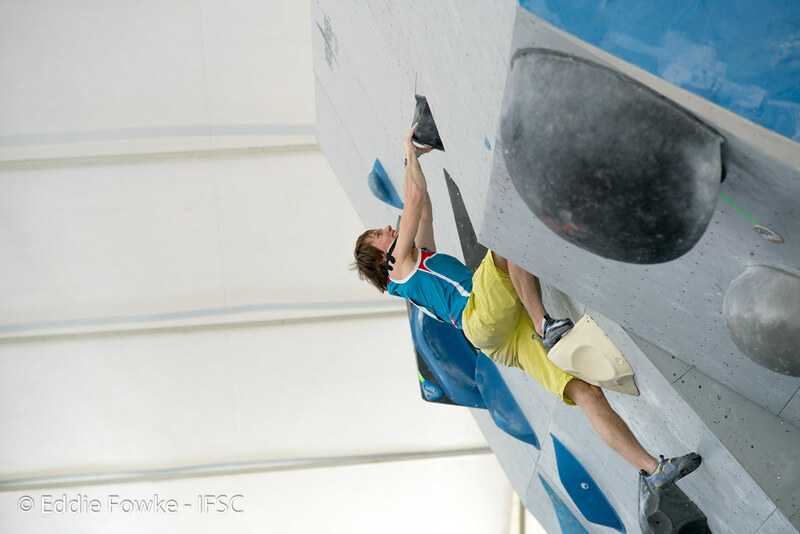 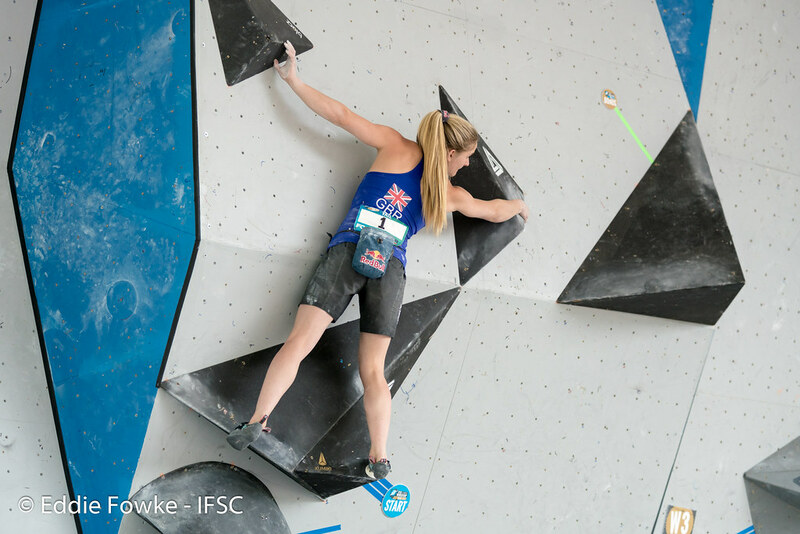 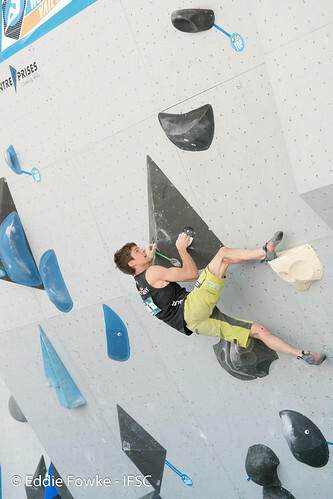 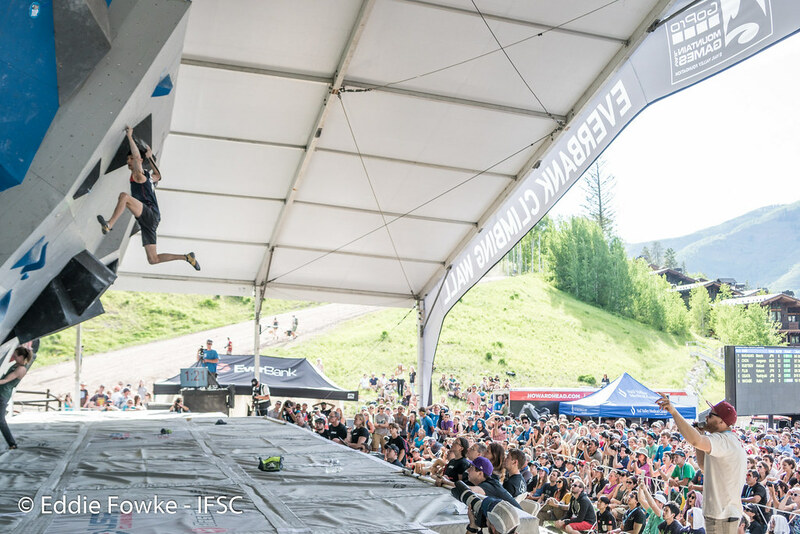 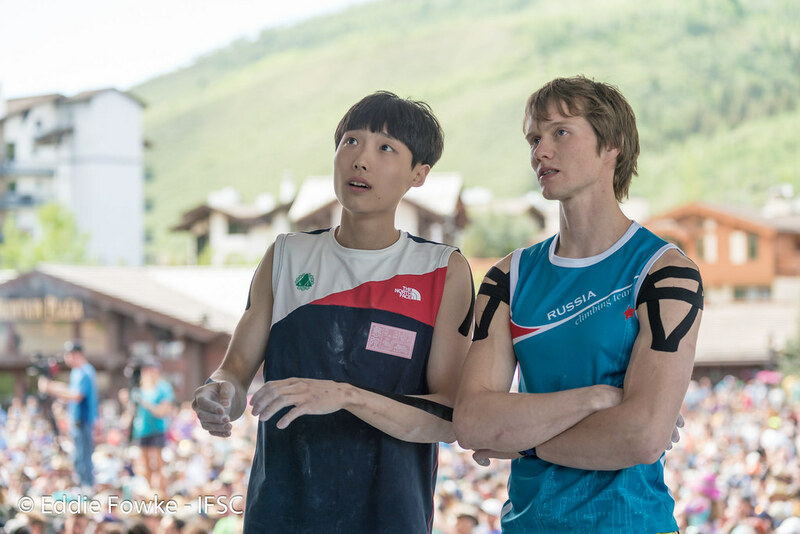 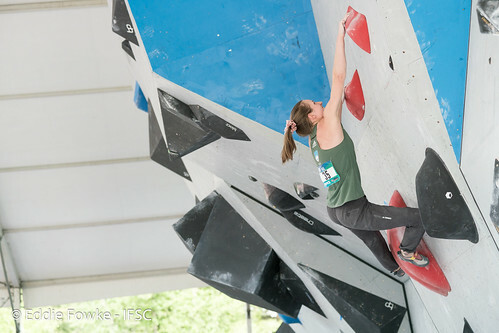 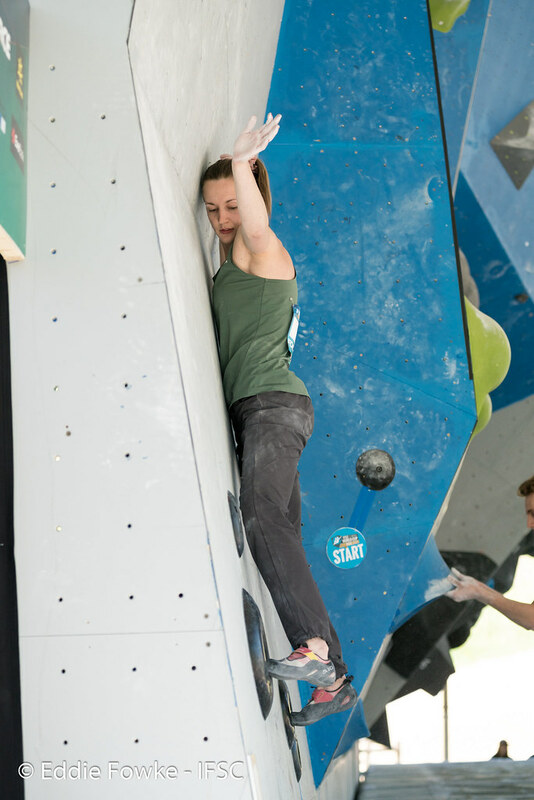 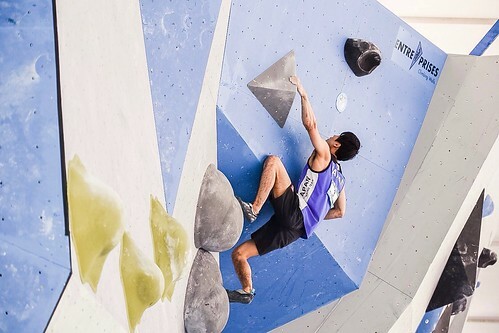 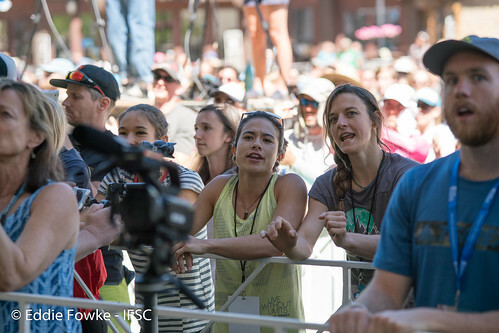 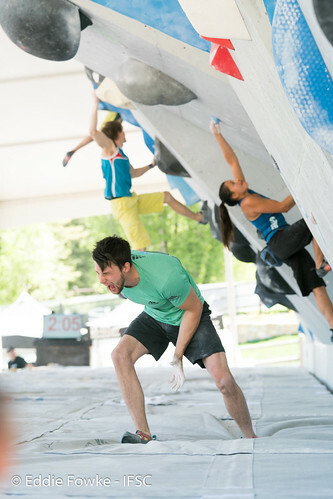 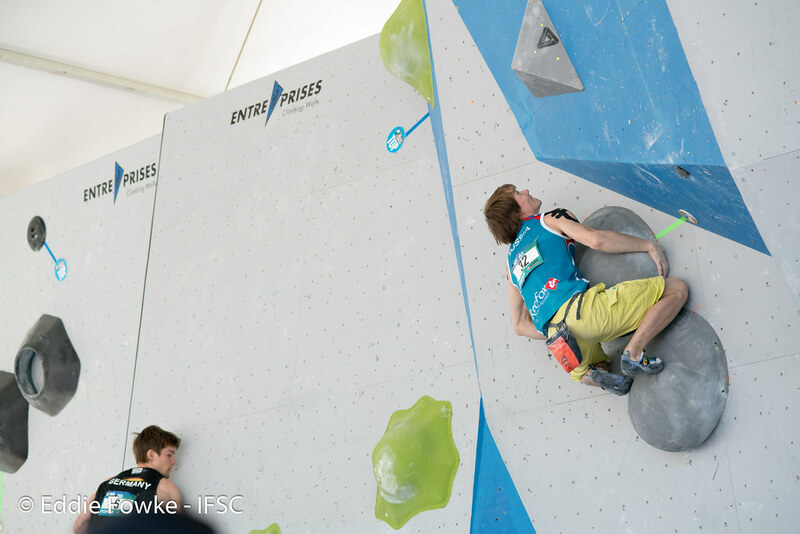 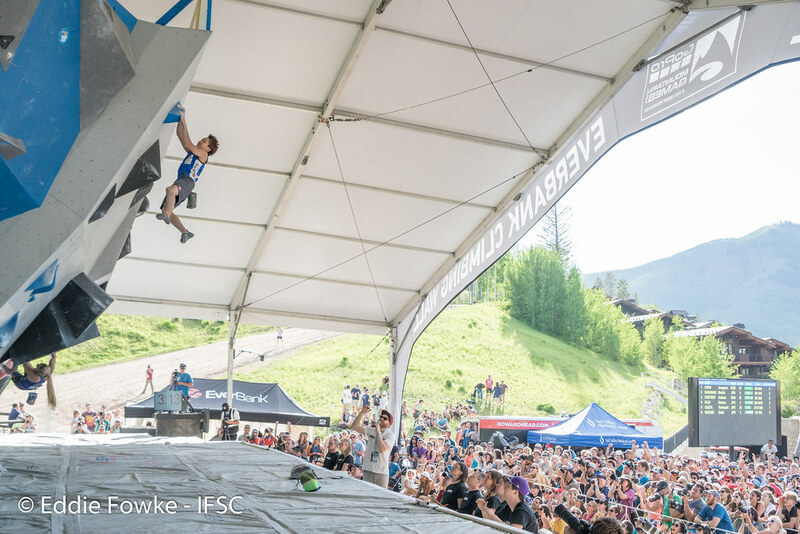 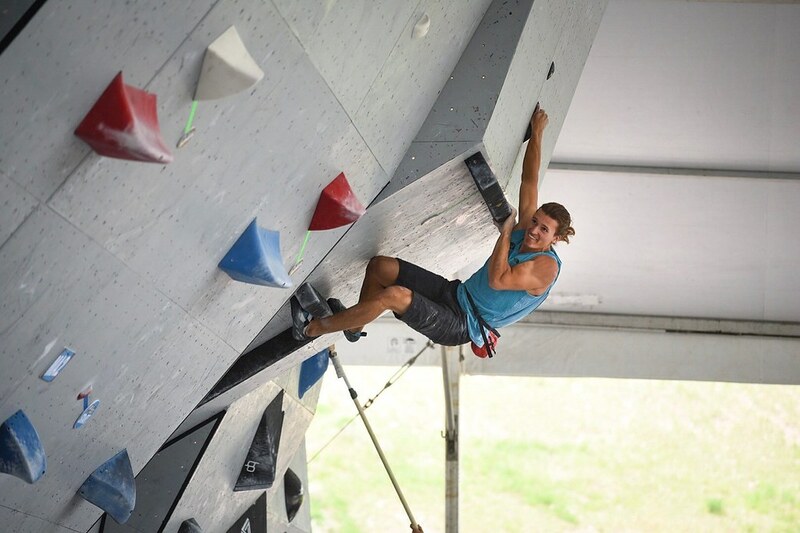 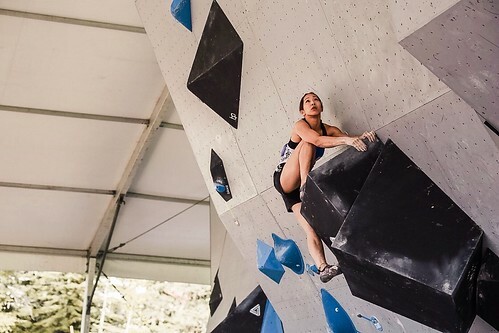 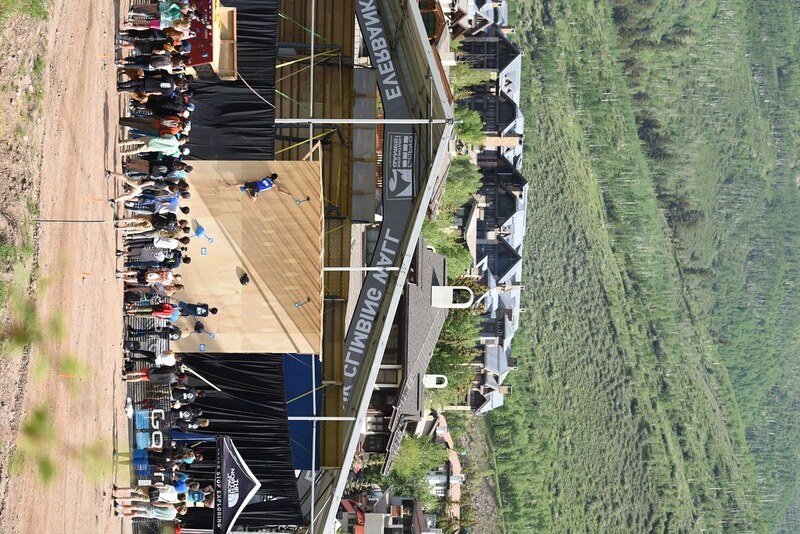 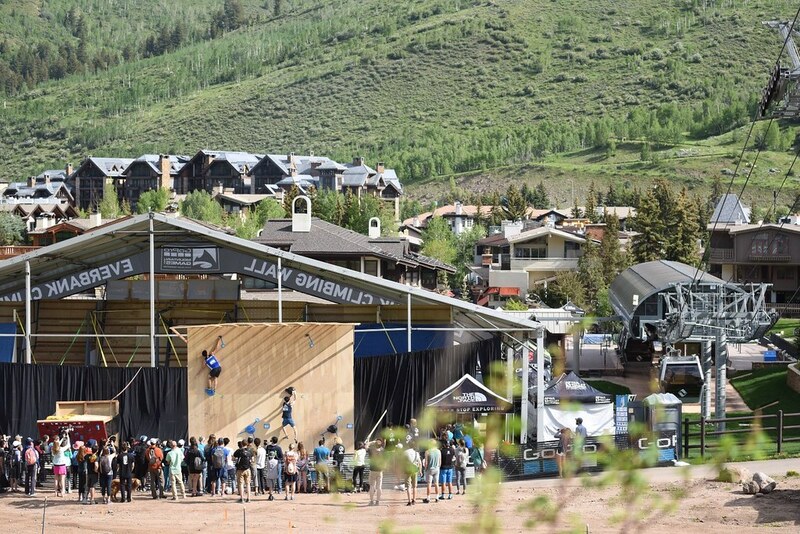 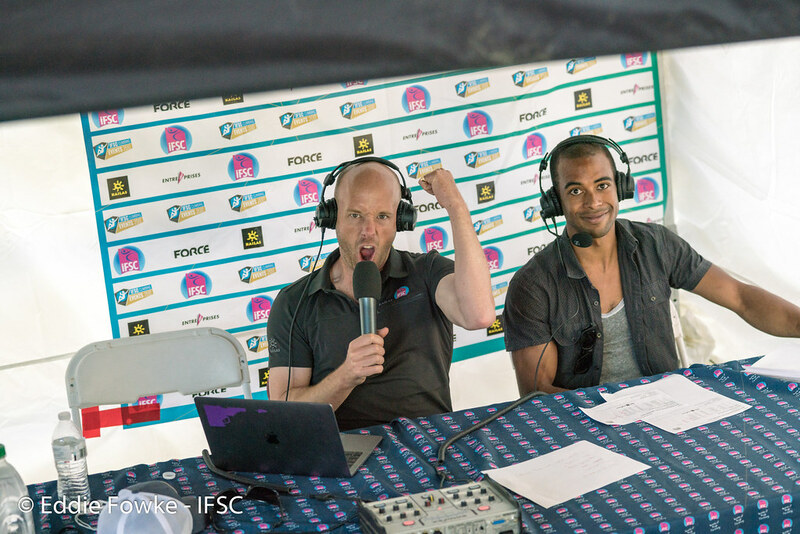 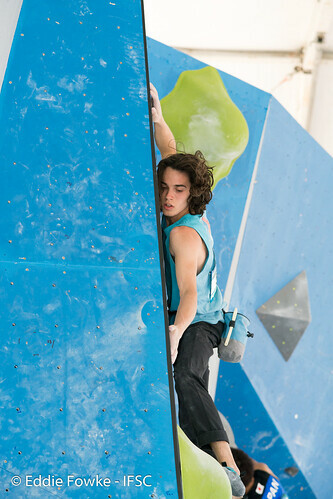 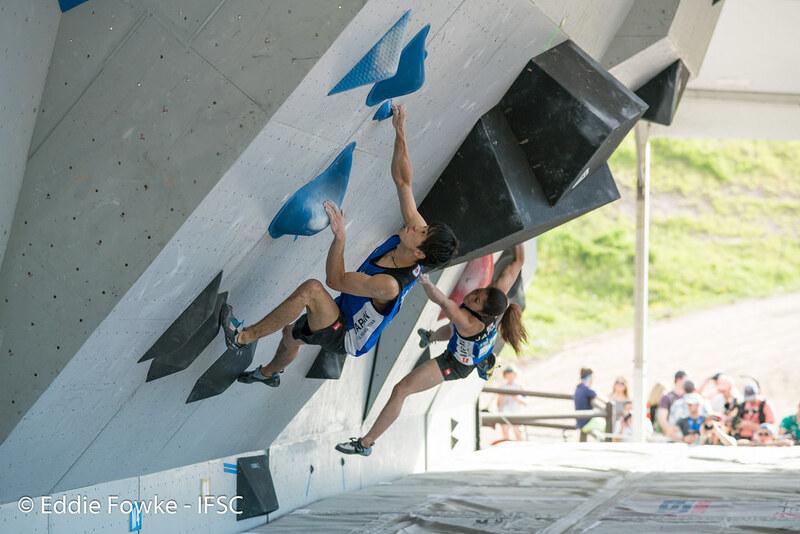 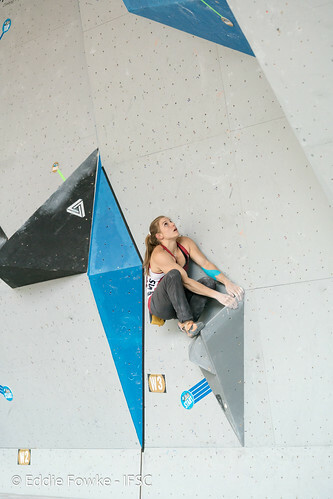 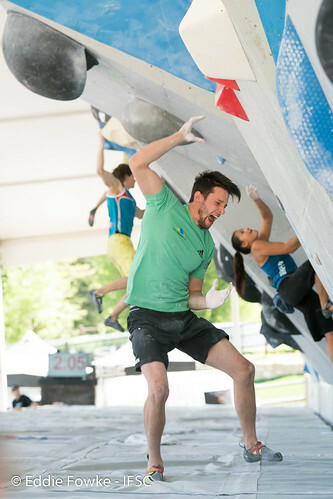 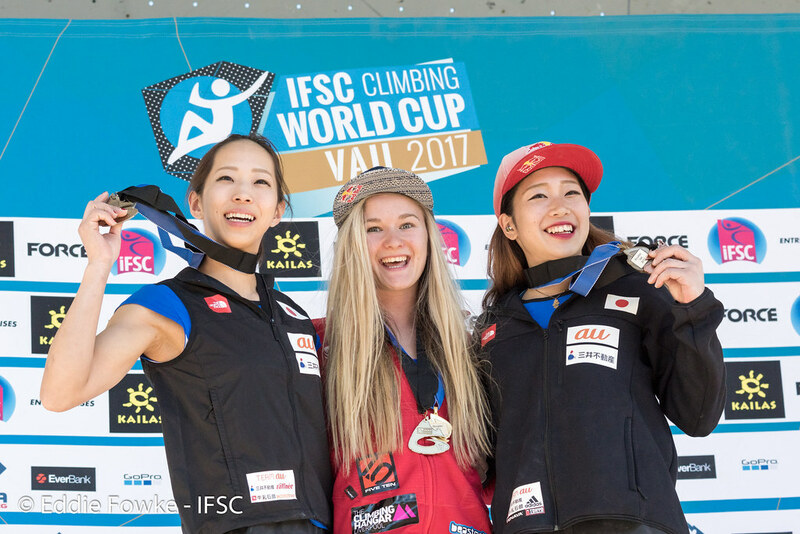 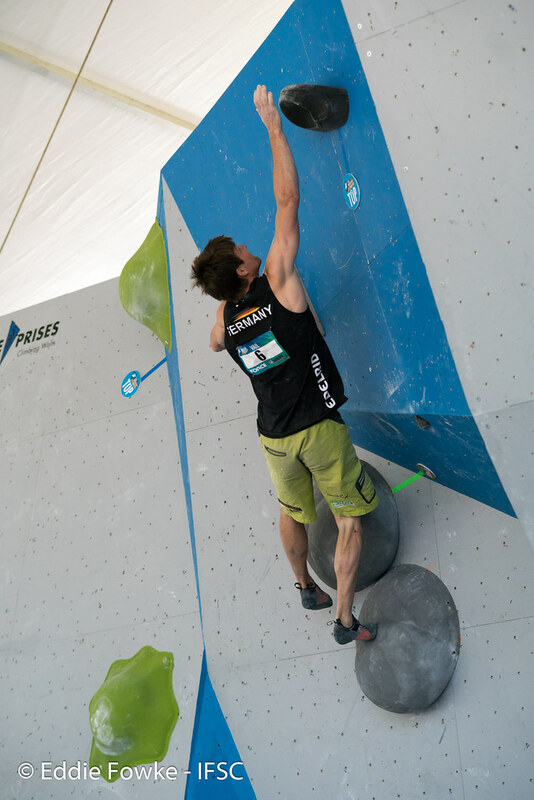 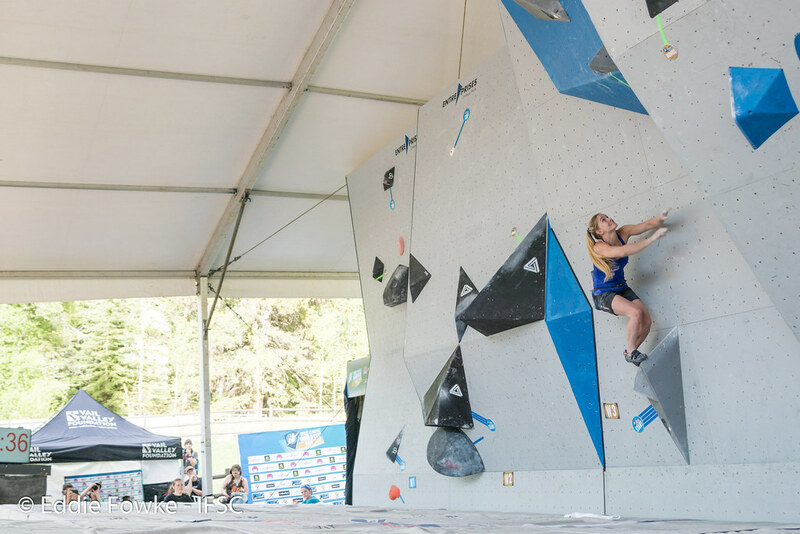 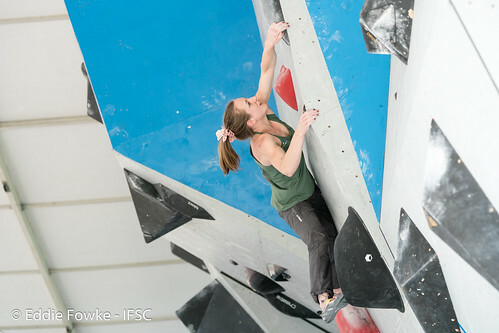 Thousands of fans gathered outside in front of the climbing wall in Vail, Colorado, for the fifth IFSC Bouldering World Cup of the season. 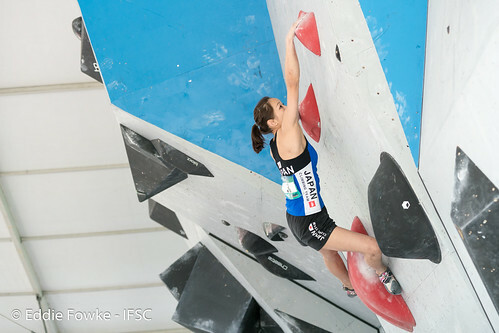 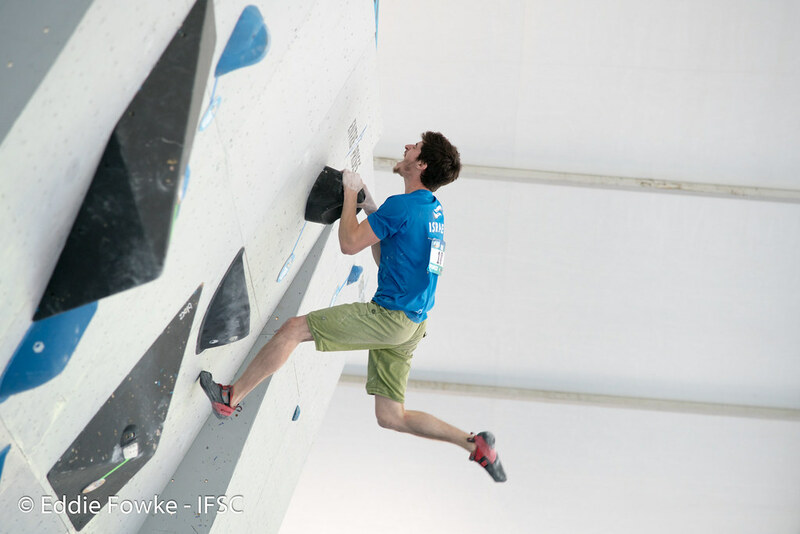 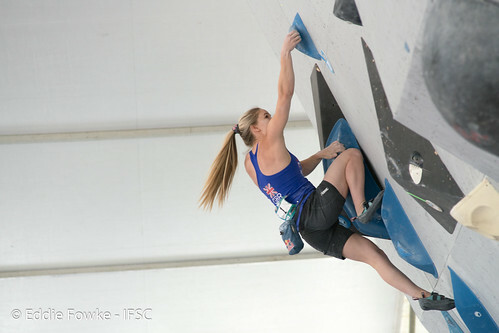 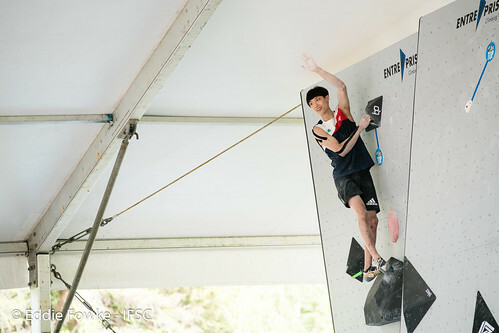 The athletes did not disappoint, with the podium placements coming down to the last problems of the final round. 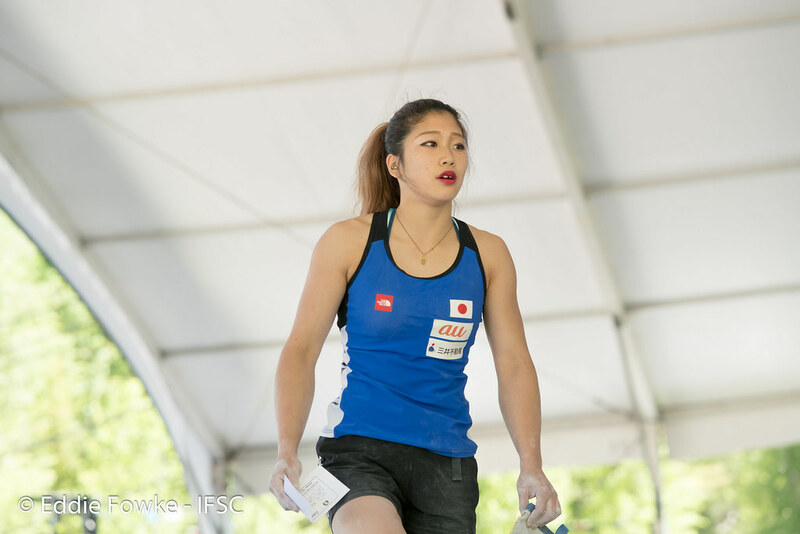 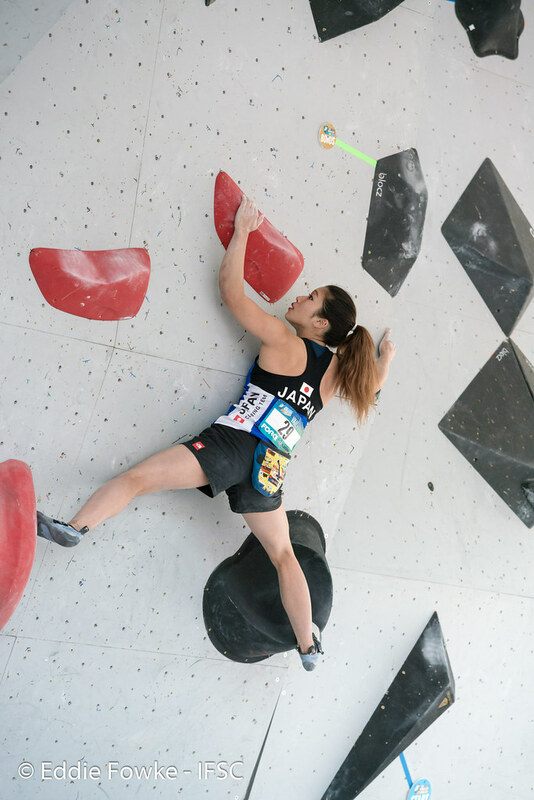 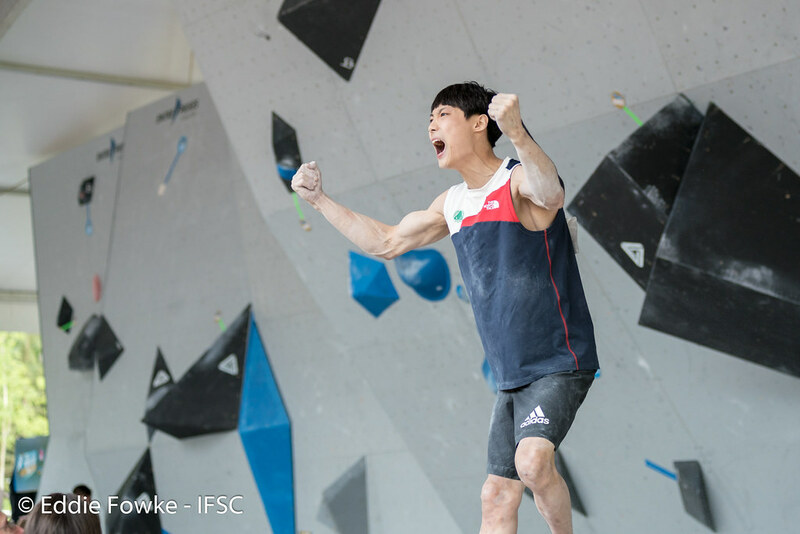 Japan dominated the early rounds, taking nine of the top ten places for the men in qualifications and sending 6 climbers to finals. 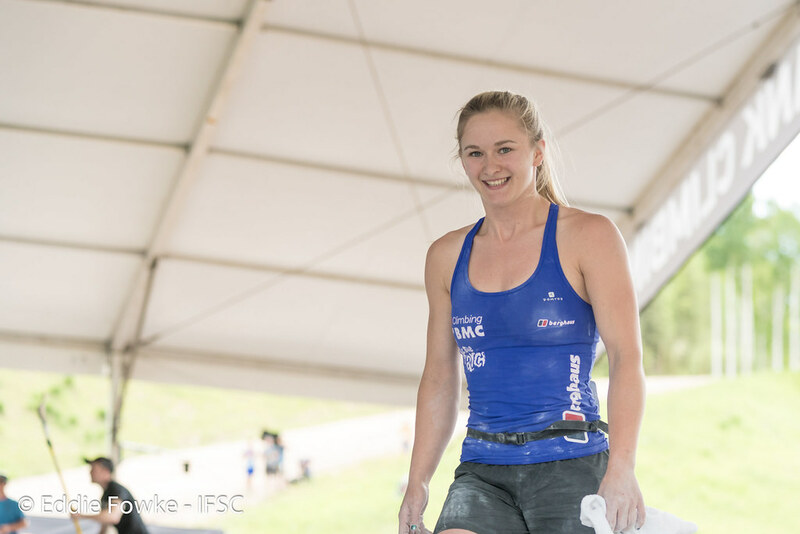 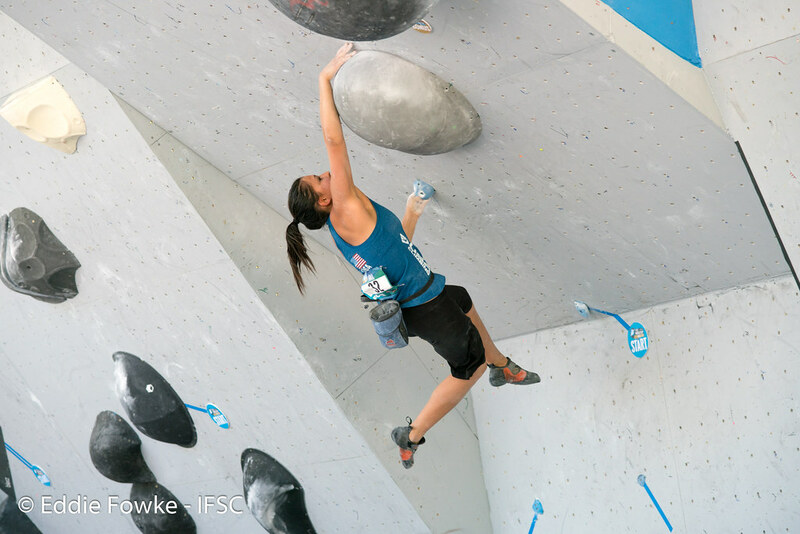 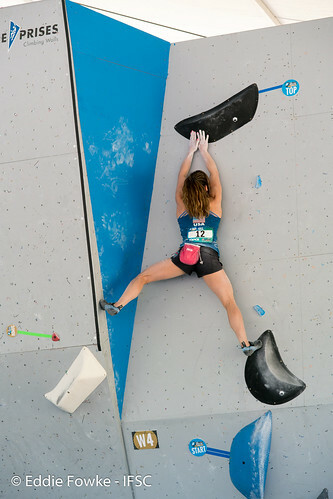 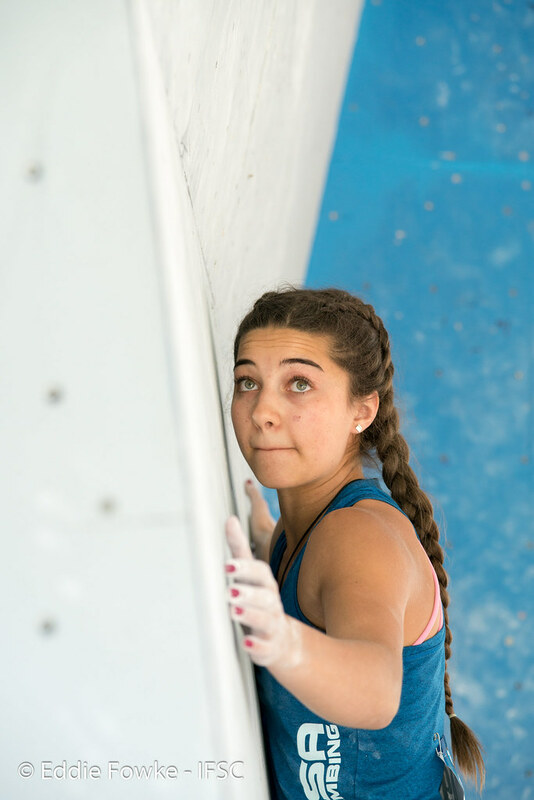 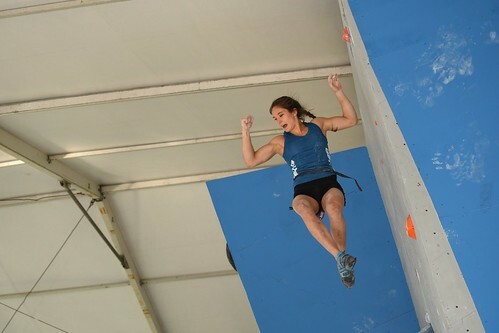 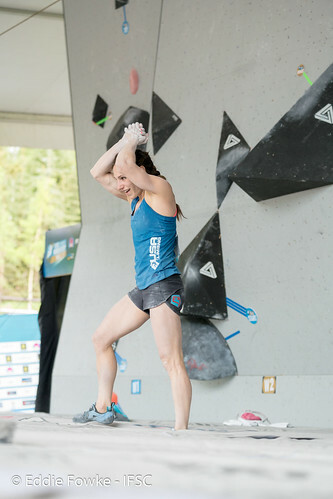 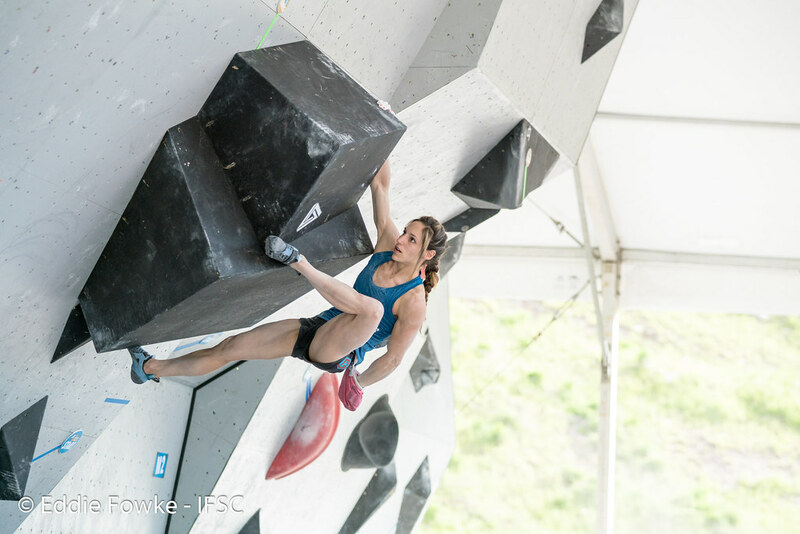 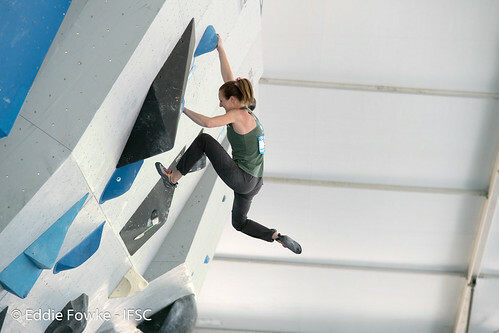 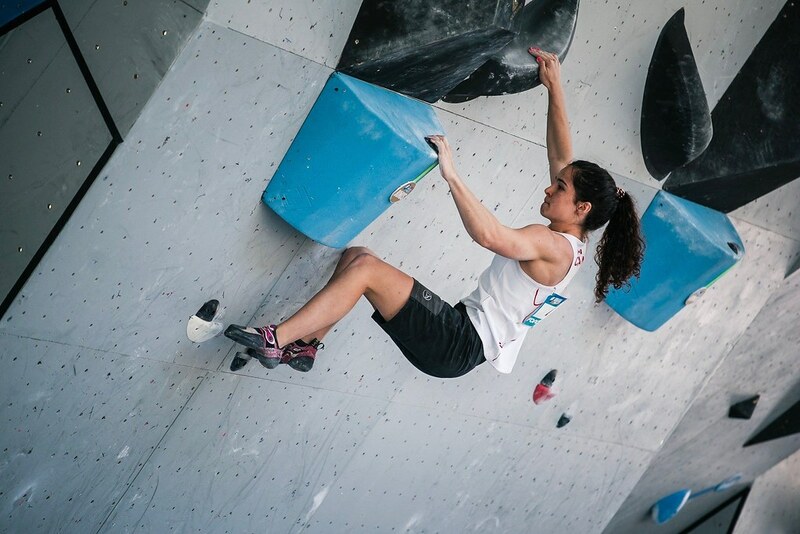 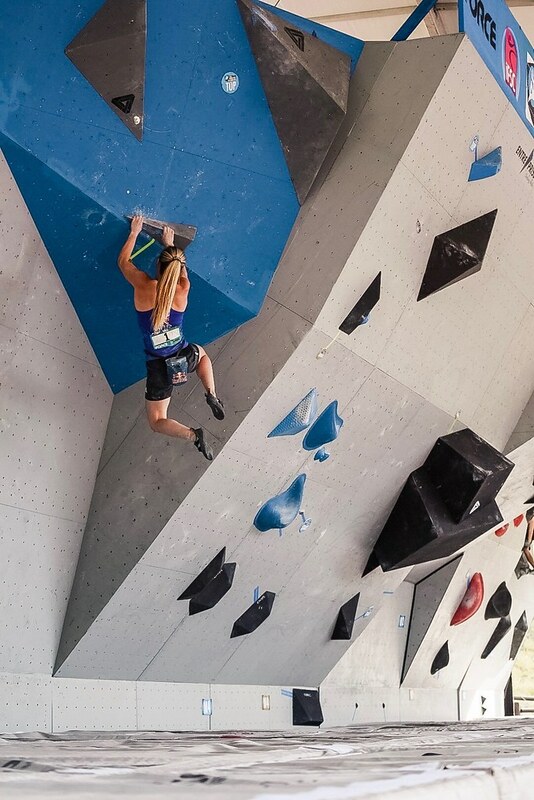 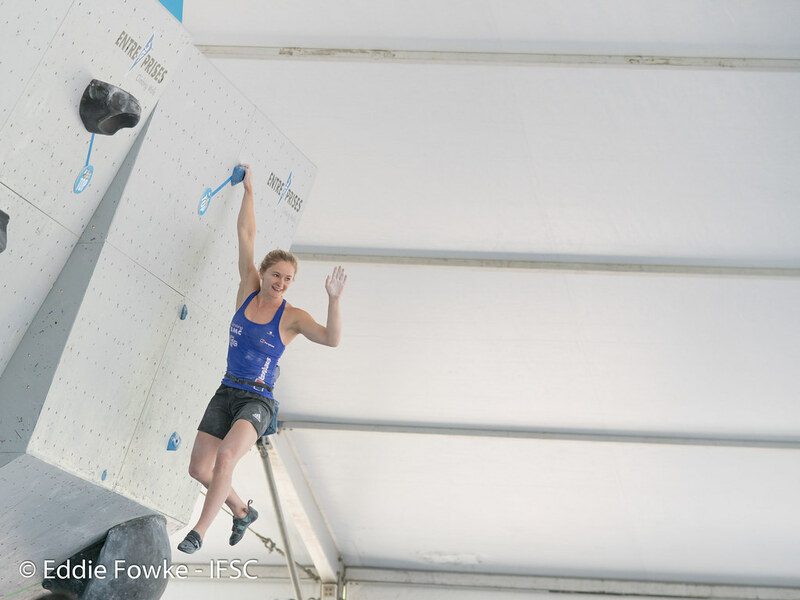 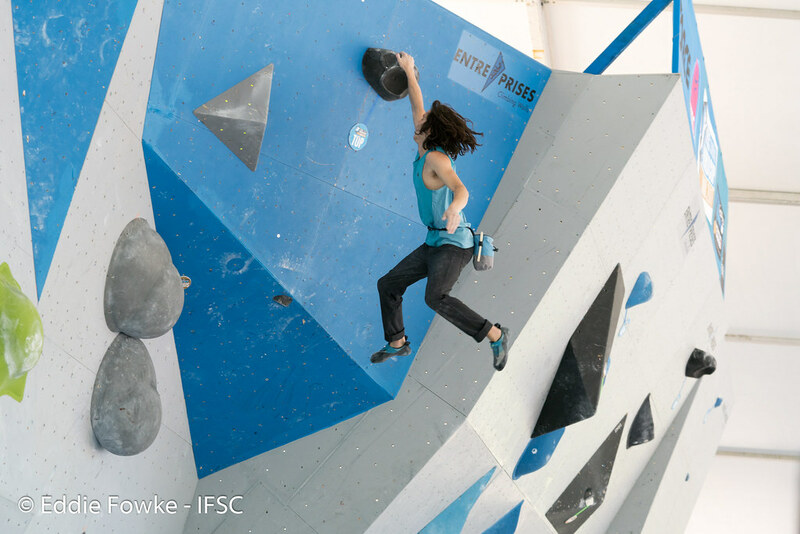 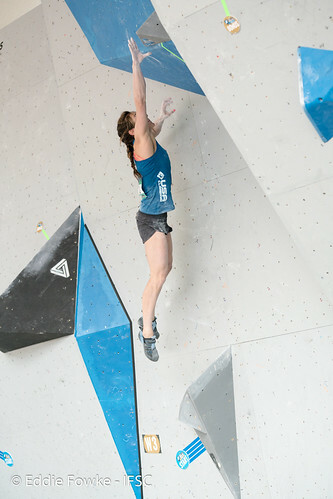 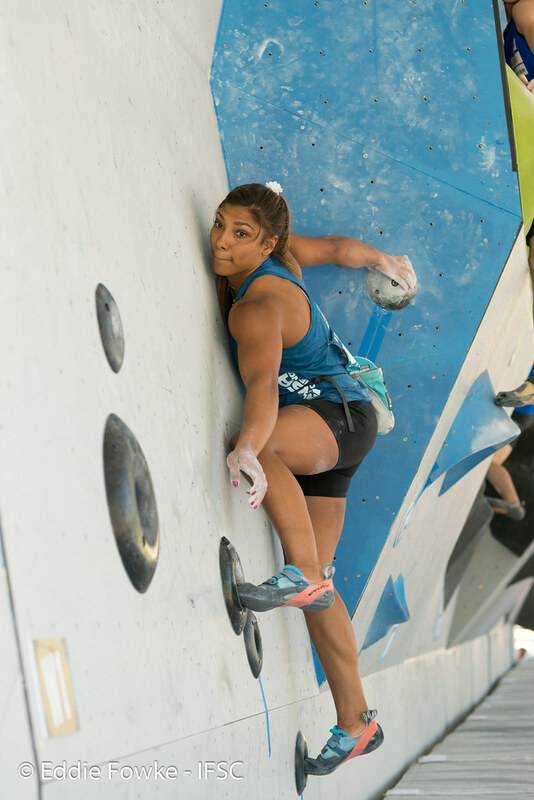 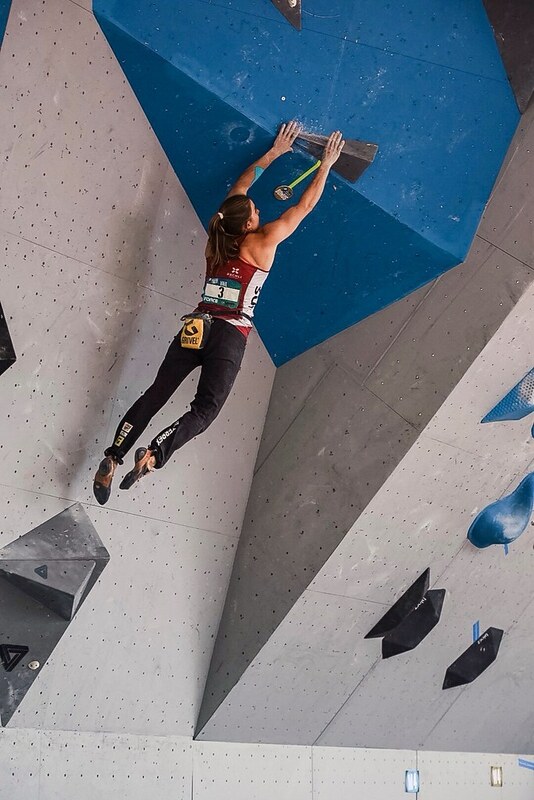 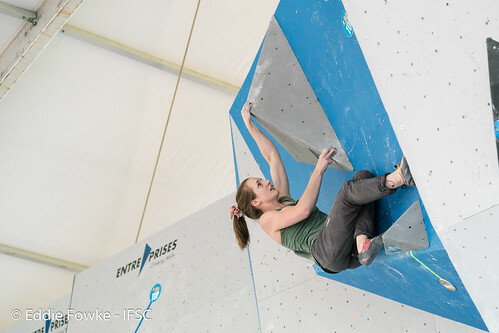 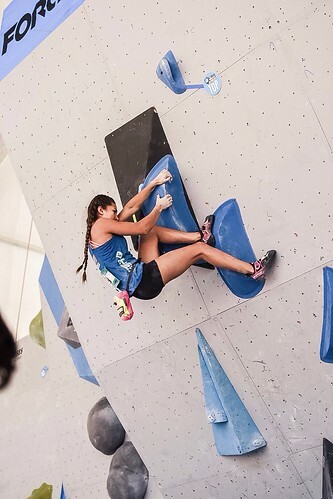 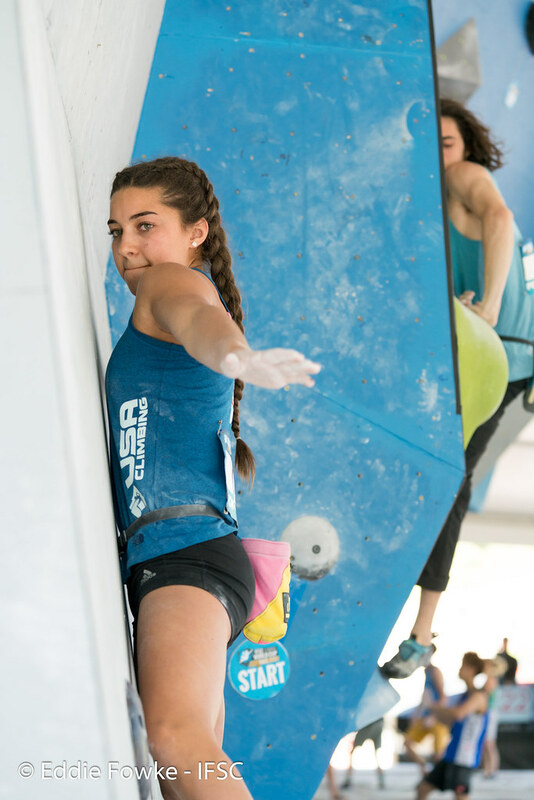 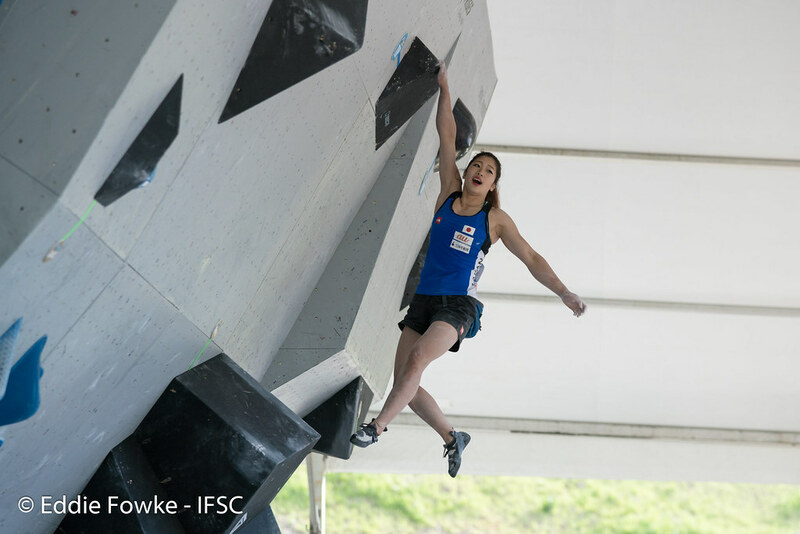 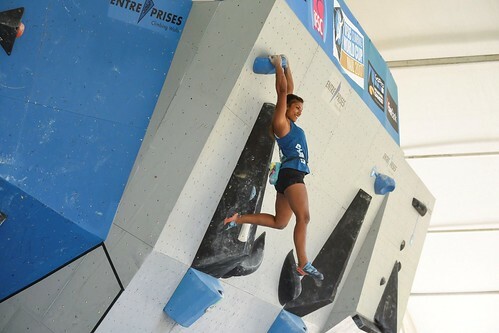 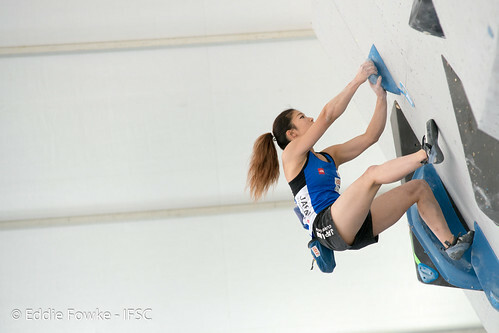 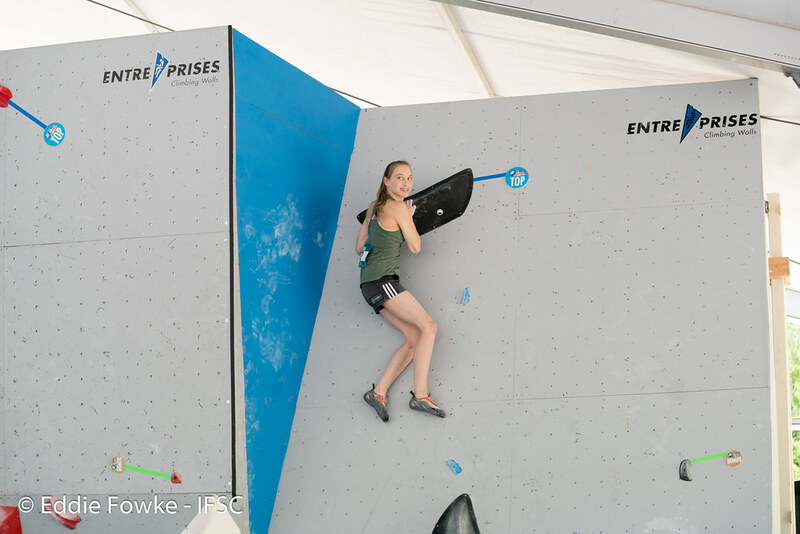 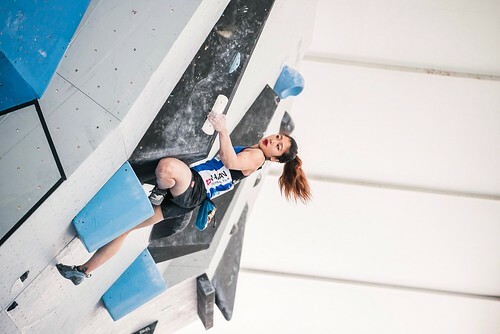 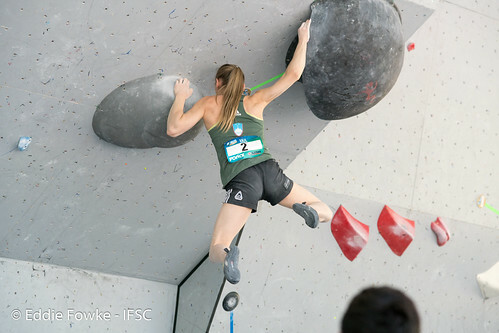 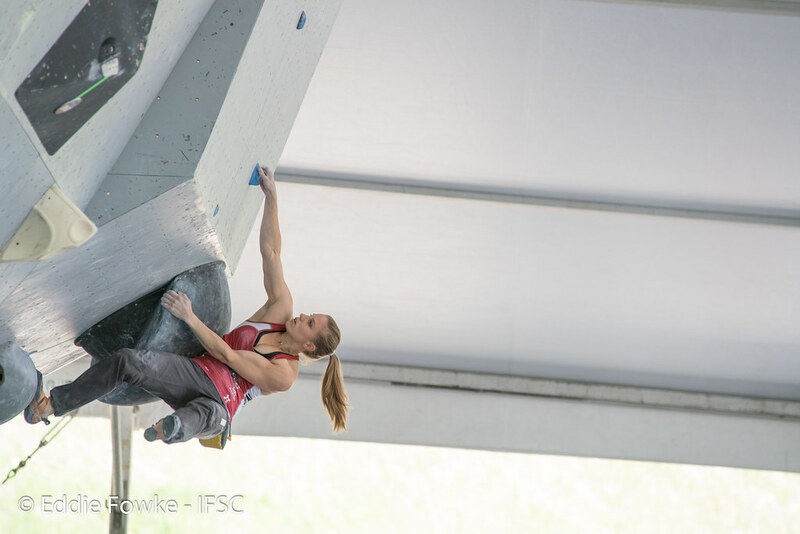 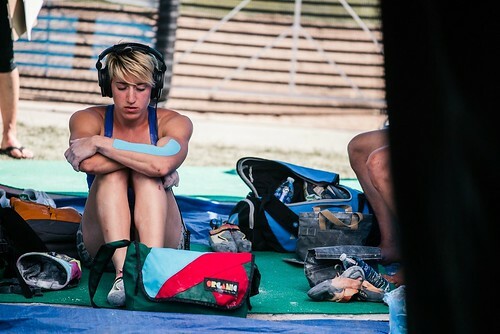 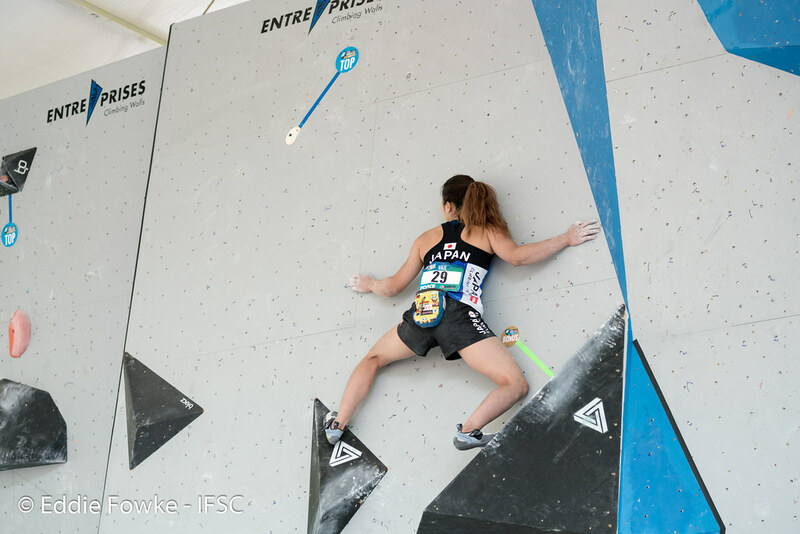 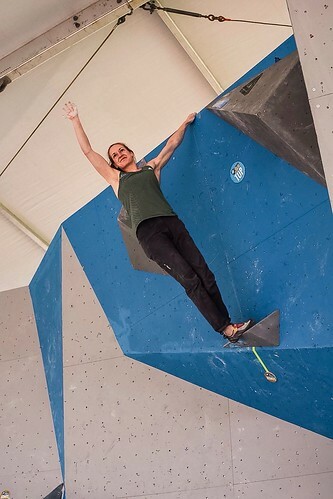 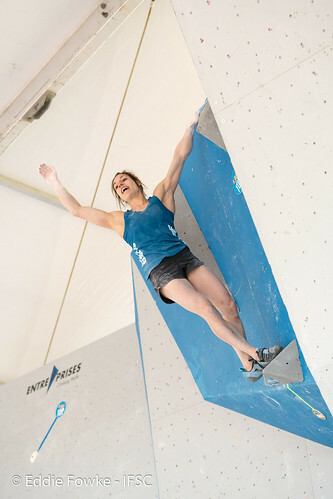 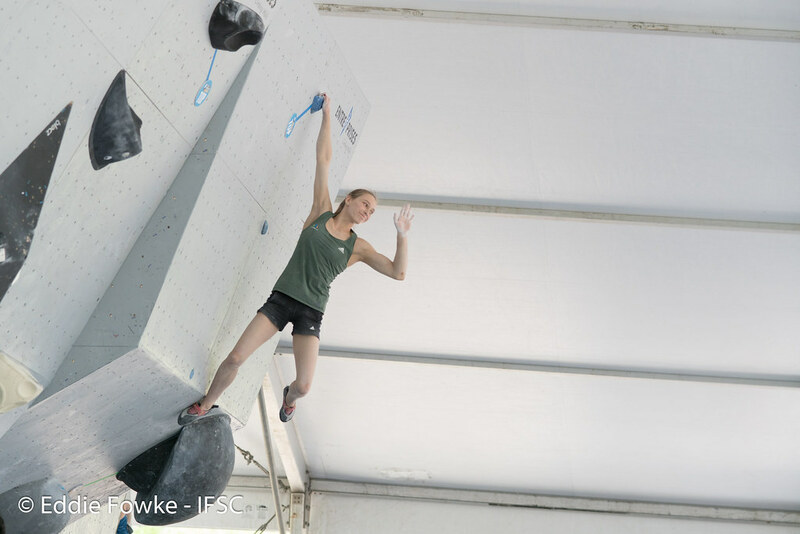 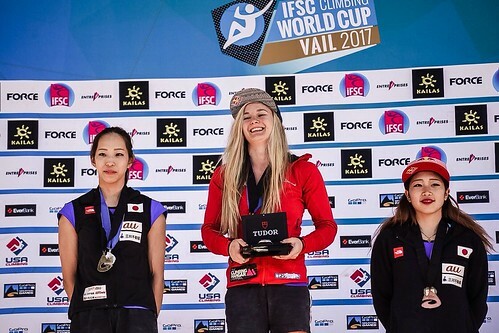 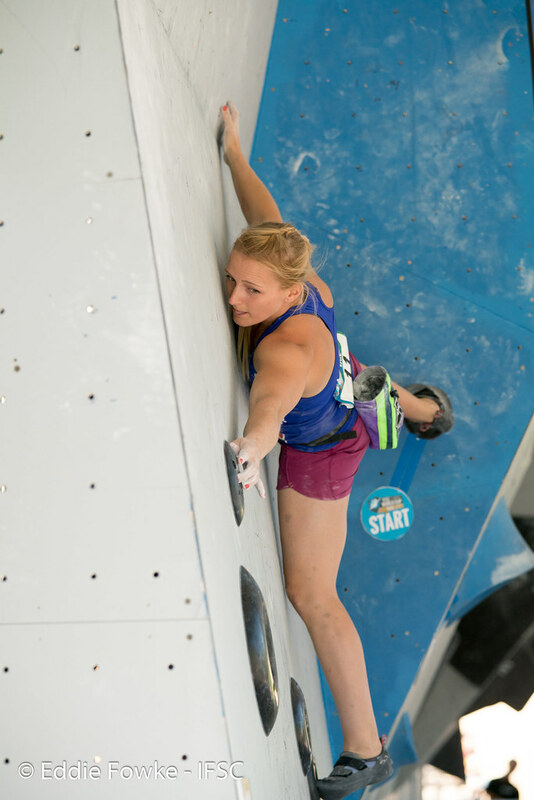 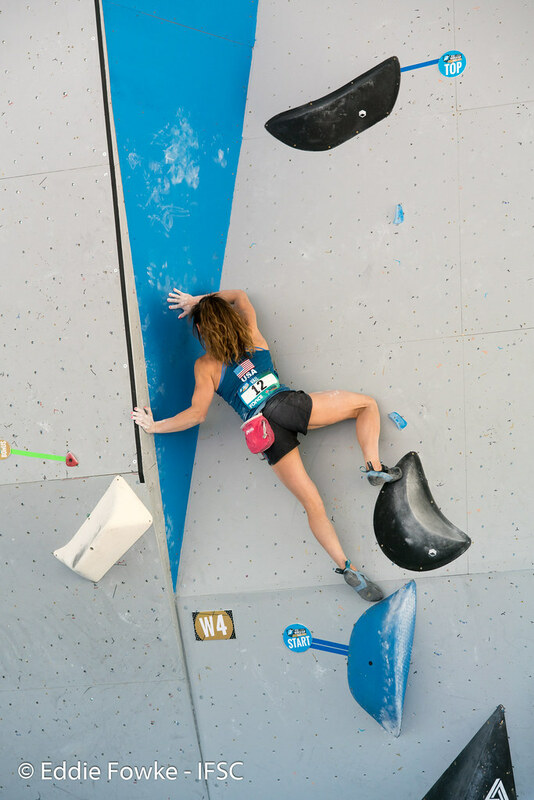 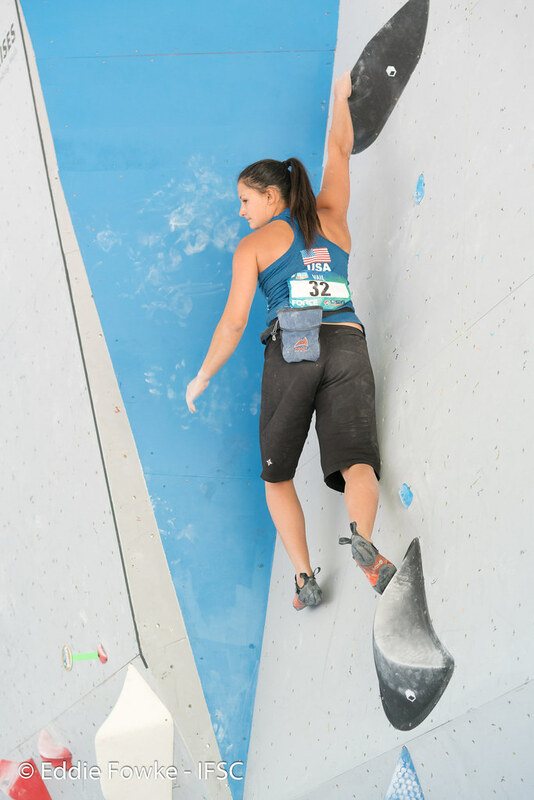 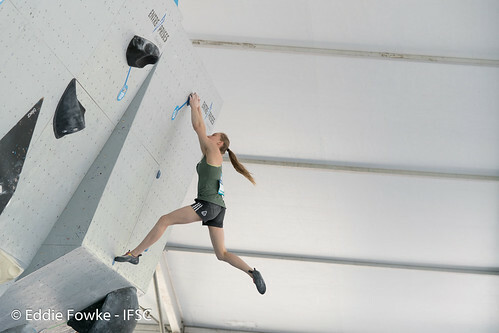 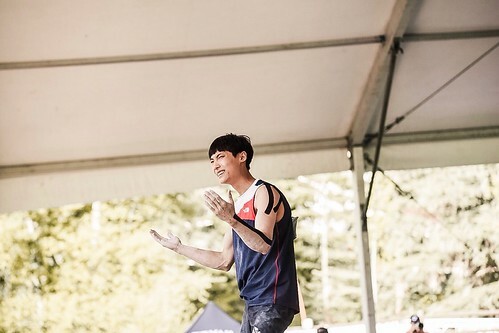 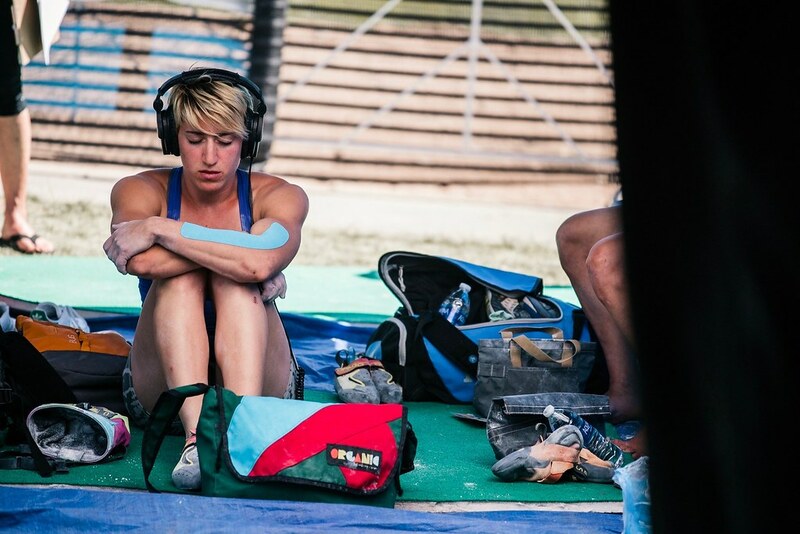 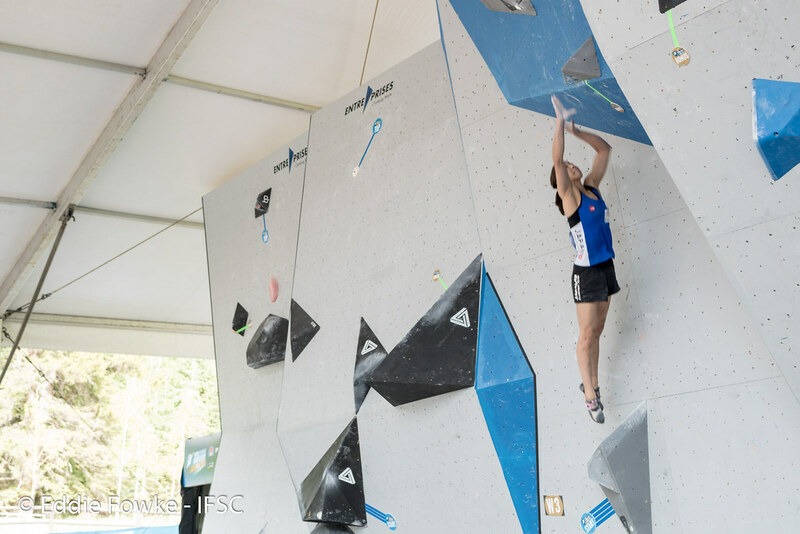 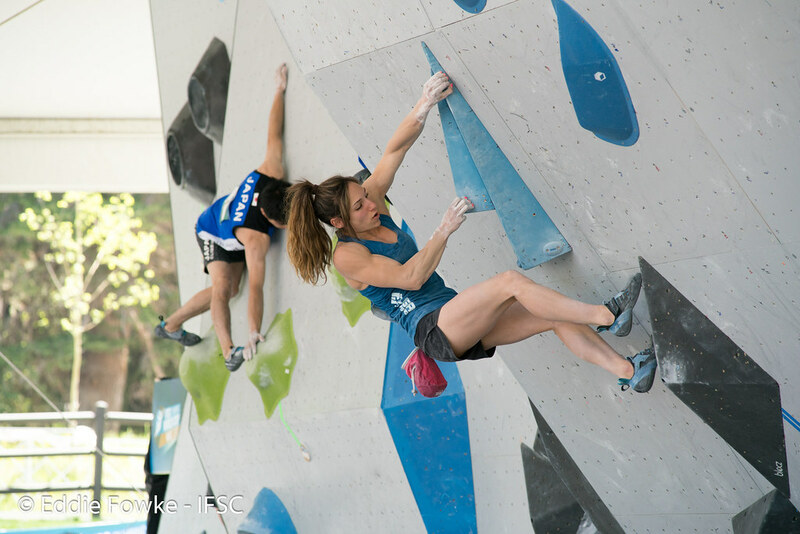 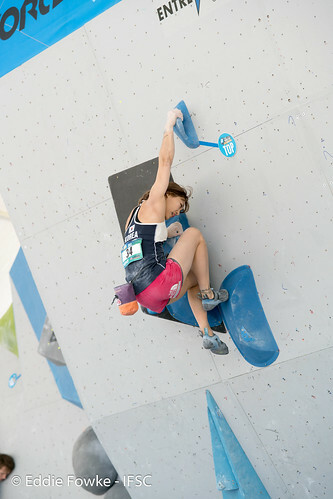 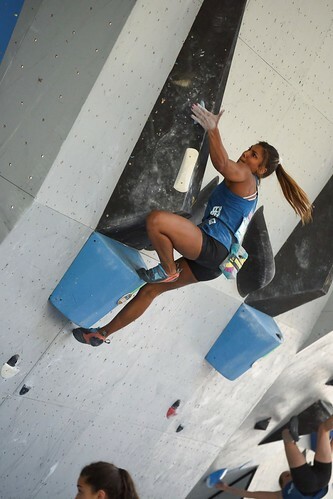 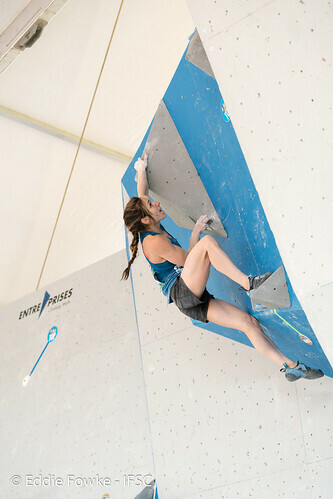 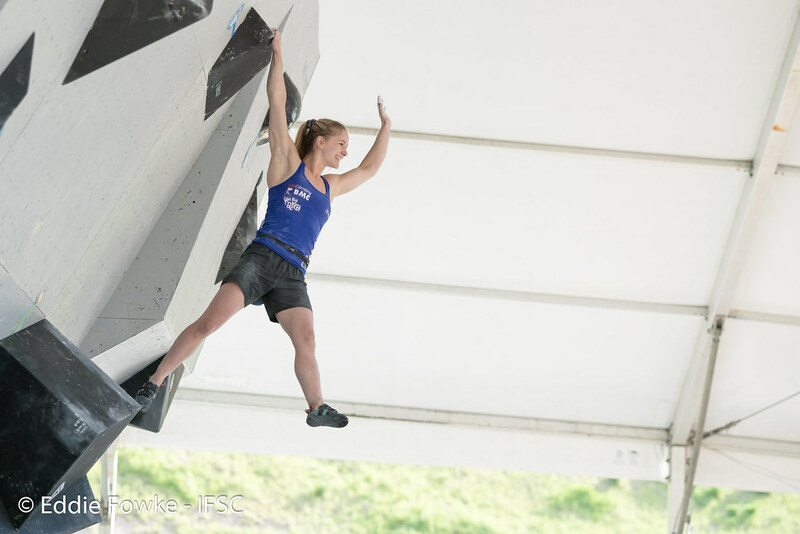 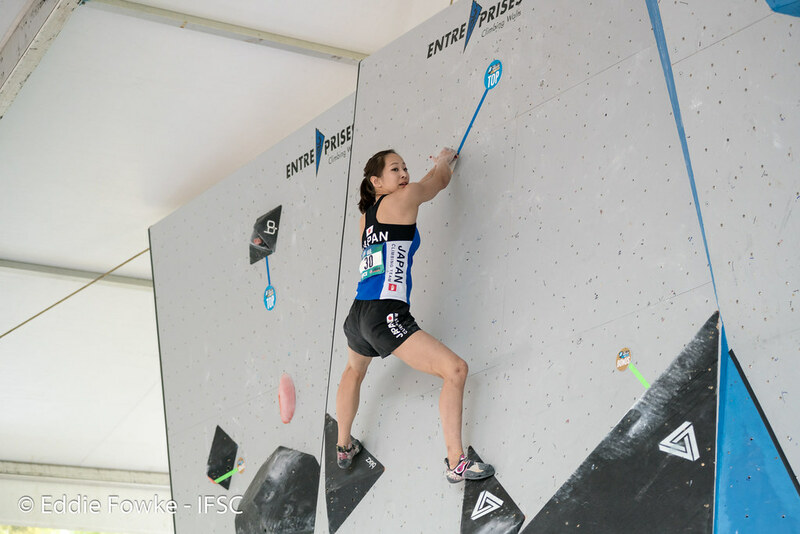 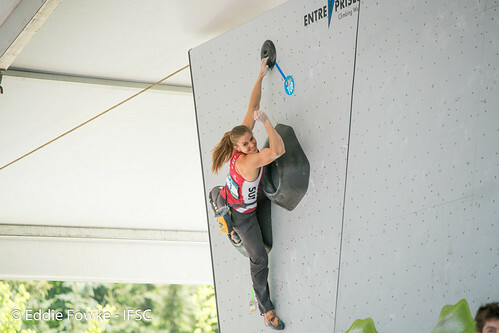 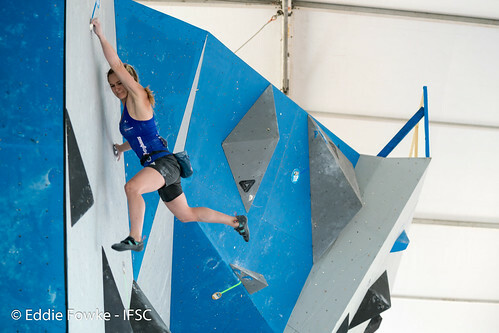 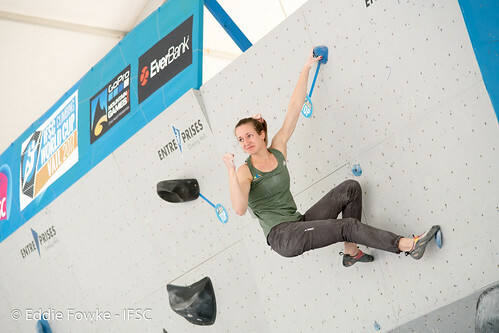 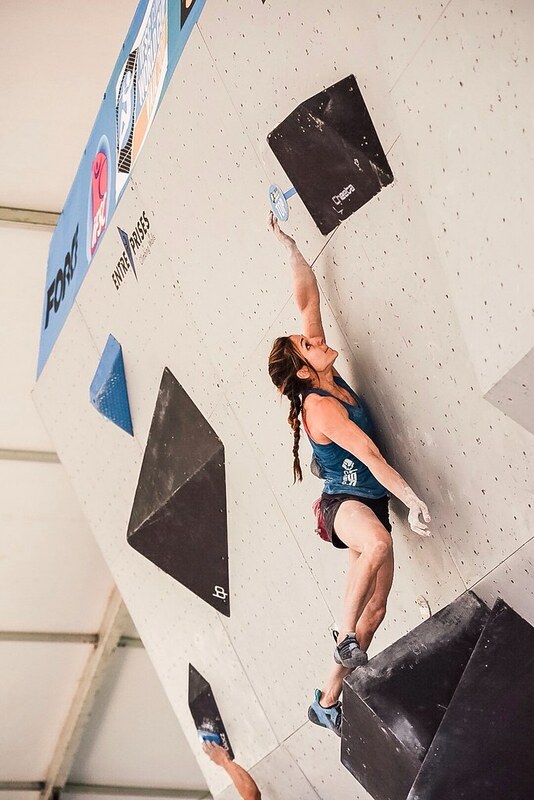 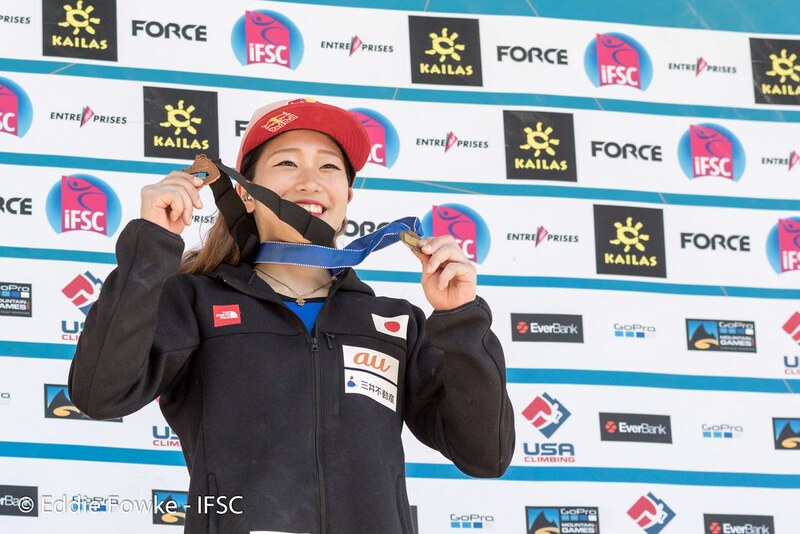 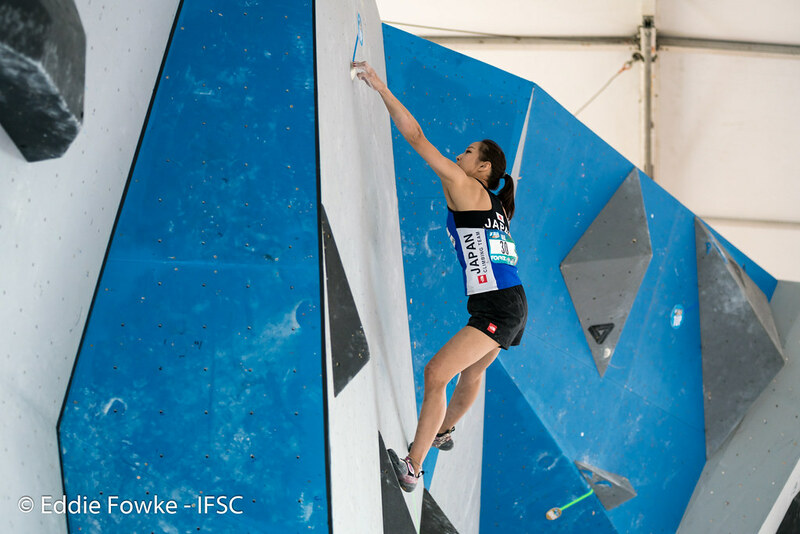 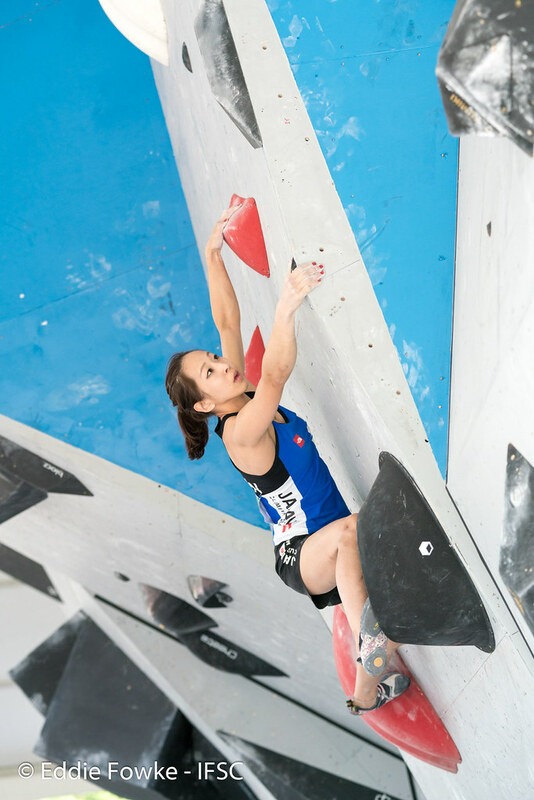 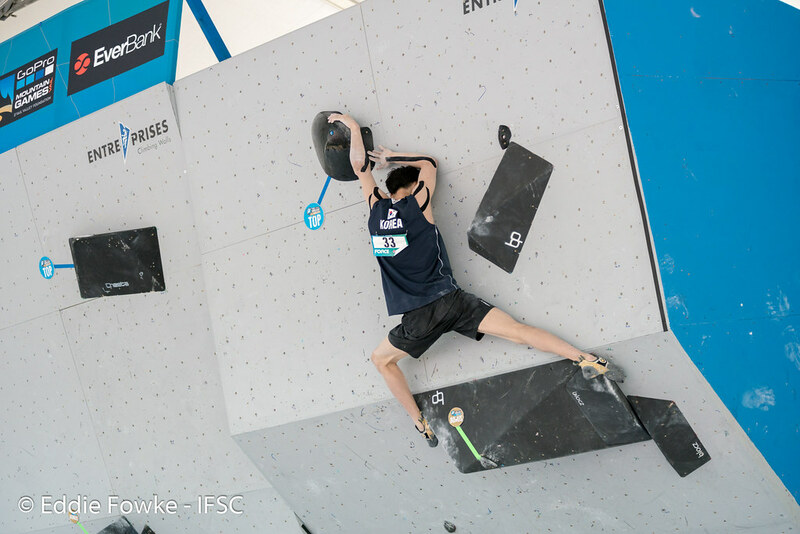 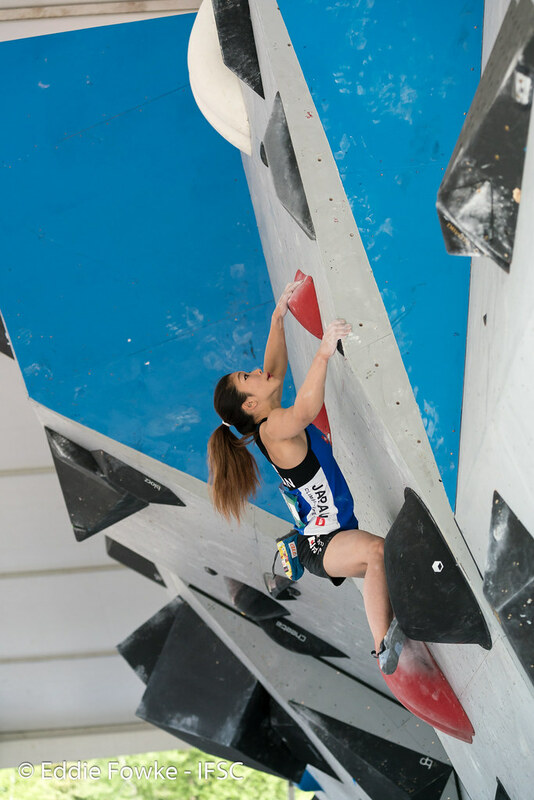 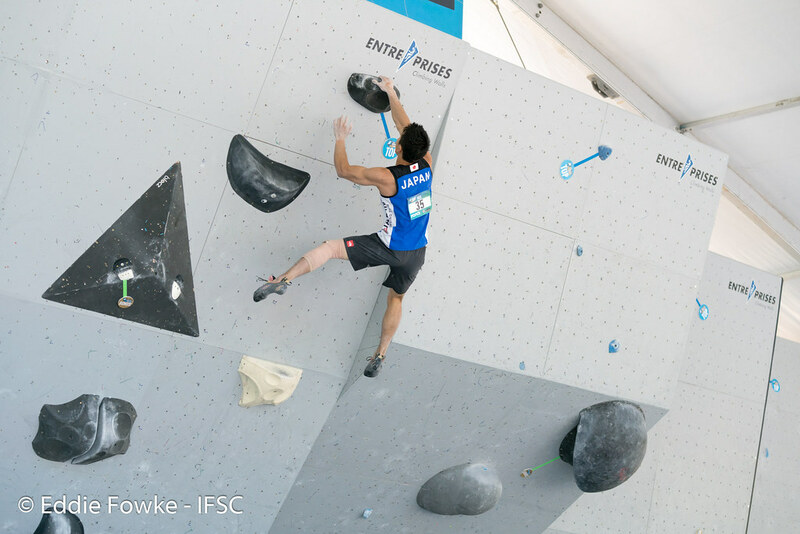 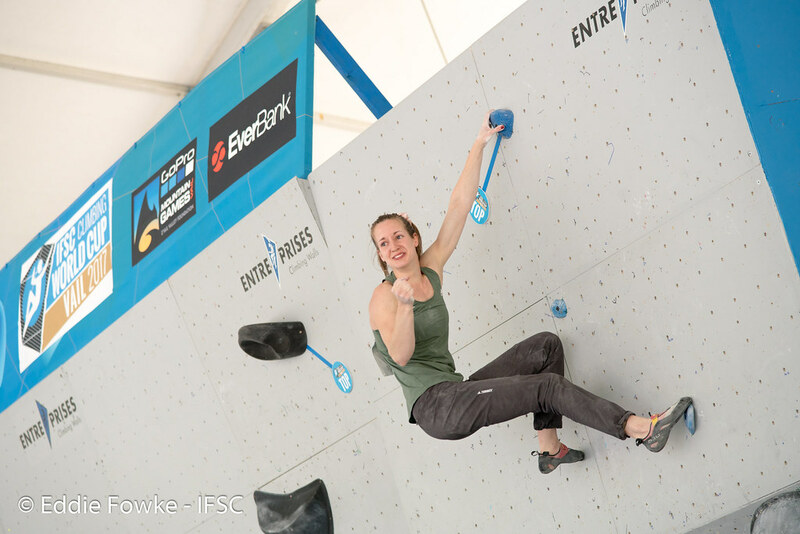 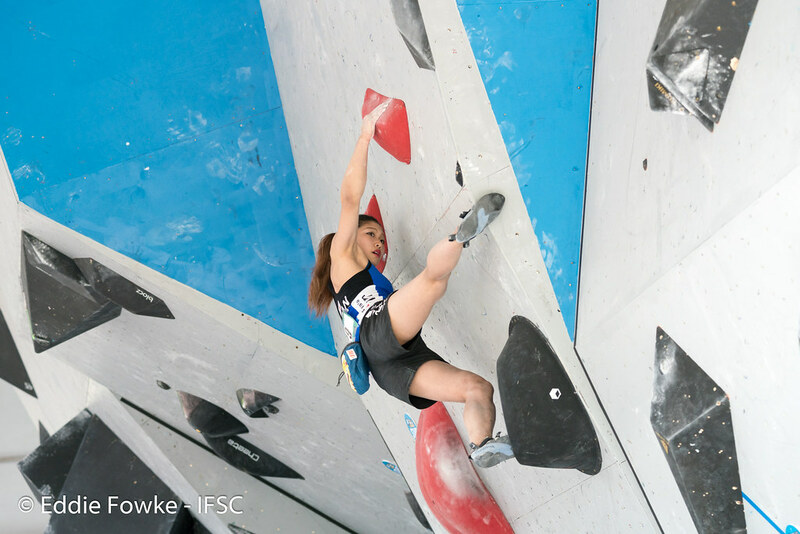 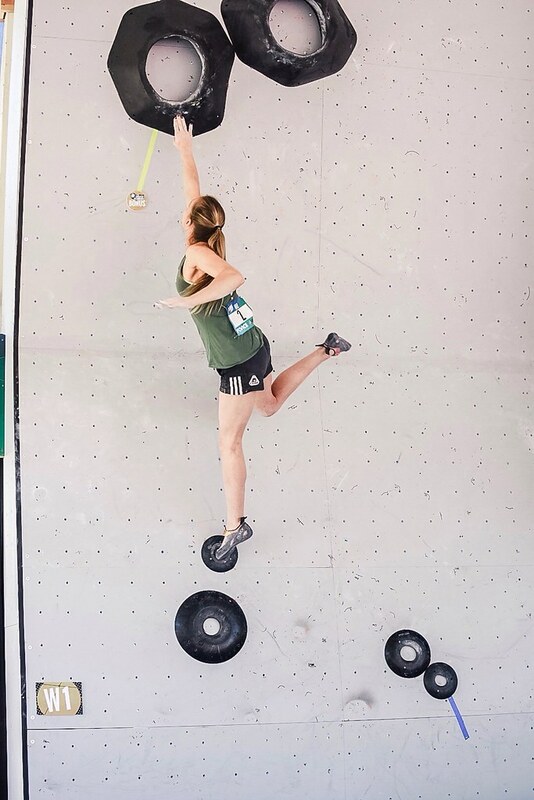 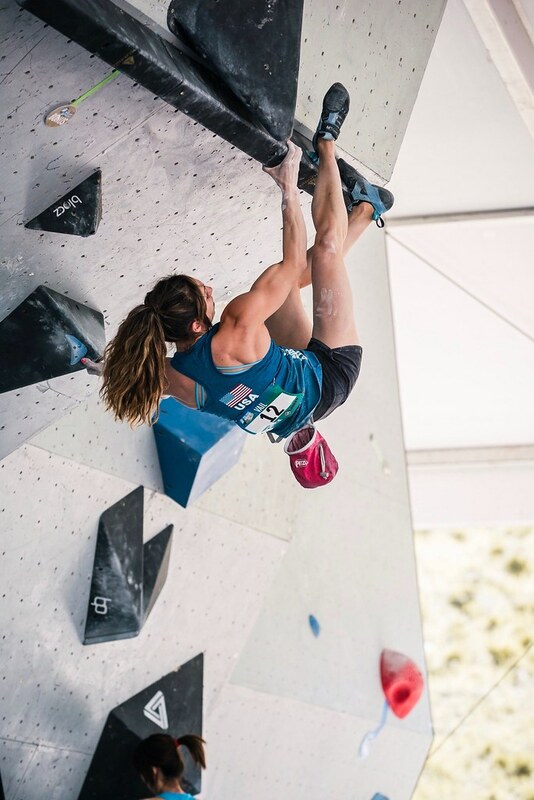 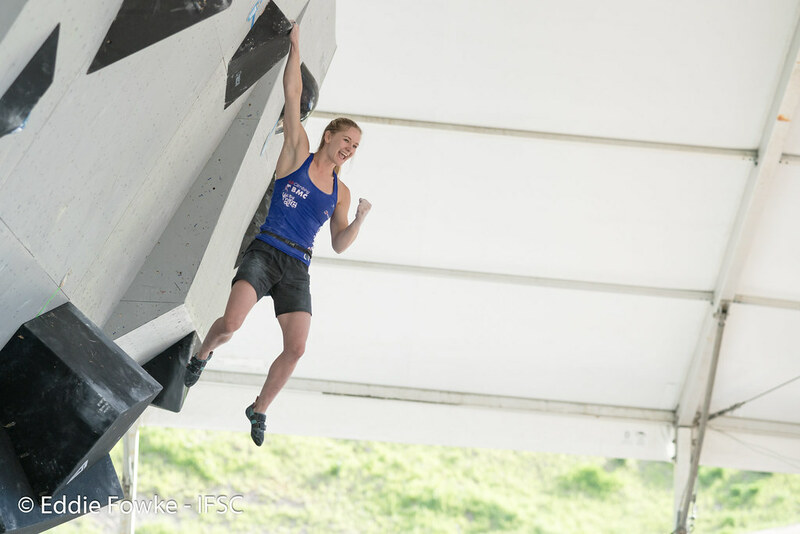 Athletes from the United States also fared well, with Sean Bailey finishing 11th in his first Bouldering event, sixteen-year-old Brooke Raboutou placing 9th in the first IFSC World Cup of her career, and legendary competitor Alex Puccio just missing out on a medal. 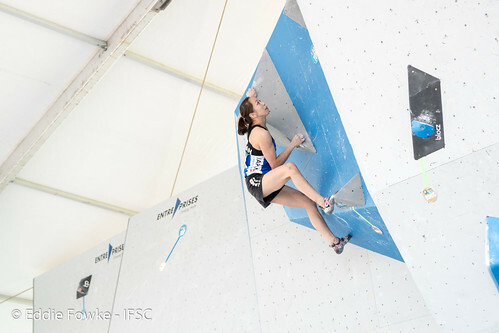 Puccio kicked-off finals with a crowd-pleasing flash of W1, a powerful introduction which stumped the other finalists. W2 changed the pace, requiring poise and balance on the slab section. 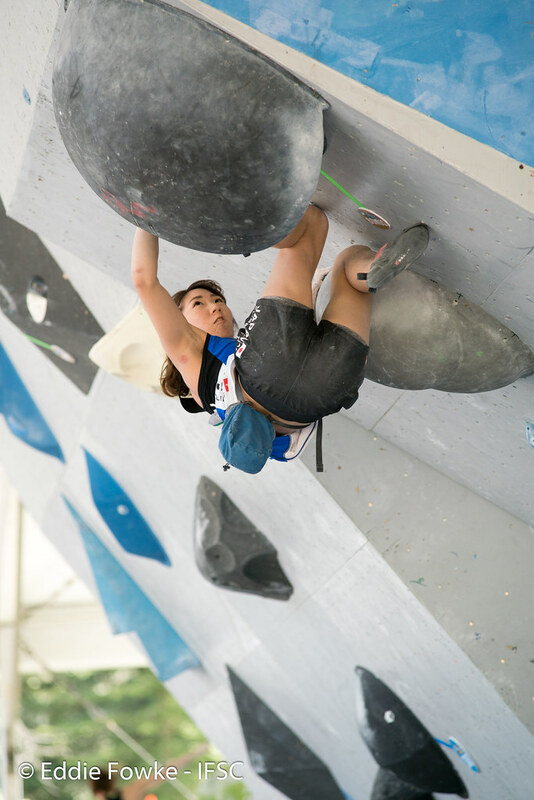 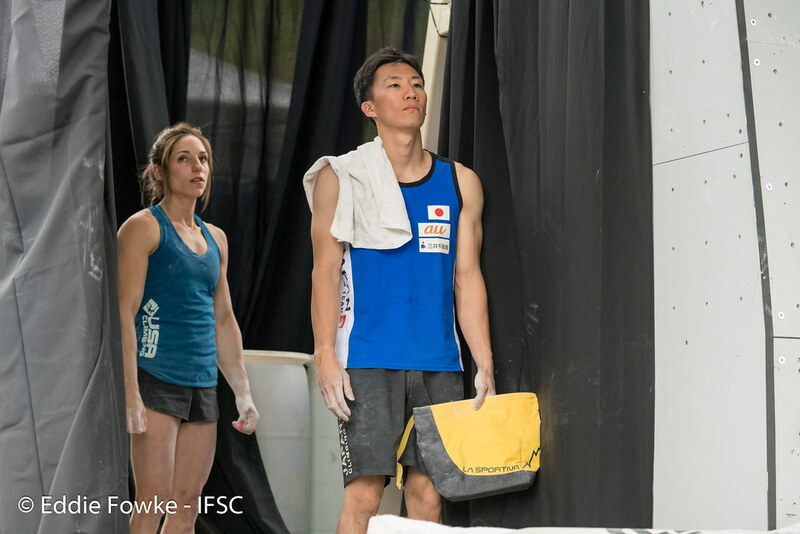 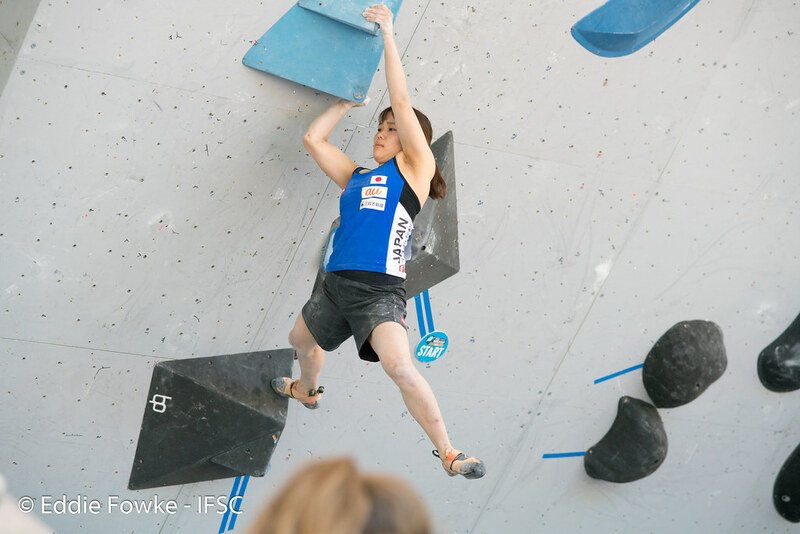 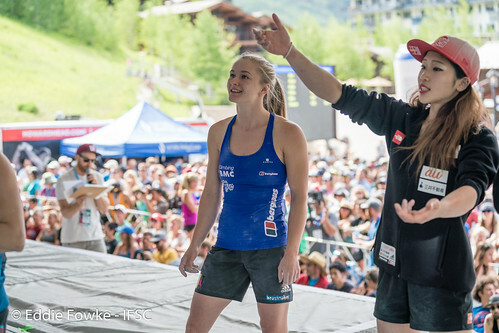 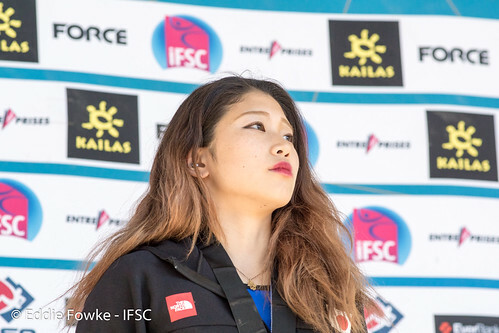 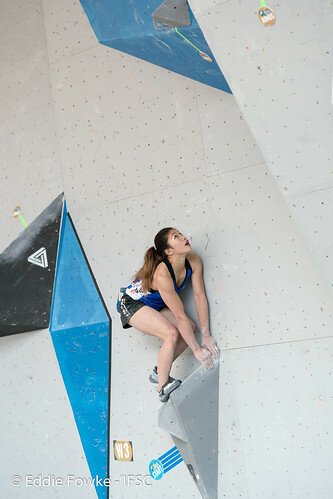 Japanese teammates Akiyo Noguchi and Miho Nonaka both solved the no-hands skip to the finishing hold, as well as Shauna Coxsey. All four athletes completed the dyno of W3, latching the thumb-catch and keeping it together to the top. With two tops apiece, W4 proved to be a decisive problem. 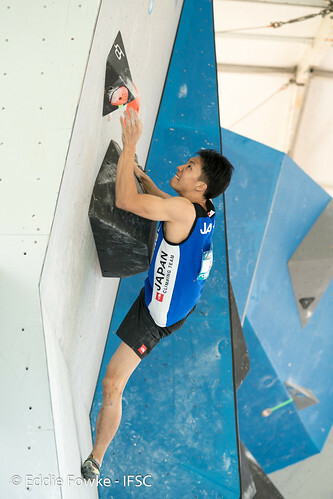 Noguchi was first to successfully wrestle with the arm-stretching volumes, flashing to finish ahead of Nonaka by one attempt. Coxsey needed to top the problem in 3 attemps or less for the victory, and she duly did so, sticking the concluding dyno with a big smile and wave for the roaring crowd. Her victory gave her a dominant lead in the season rankings and bumped Puccio down to 4th place at Vail by attempts. 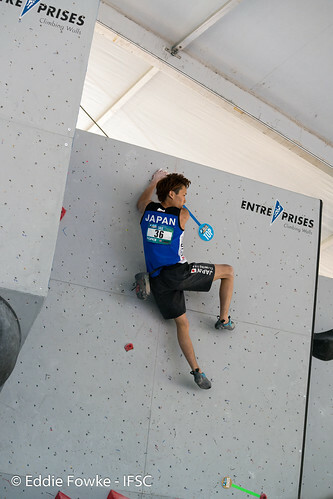 For the men, every finalist completed M1, with Yoshiyuki Ogata of Japan topping just as time expired. 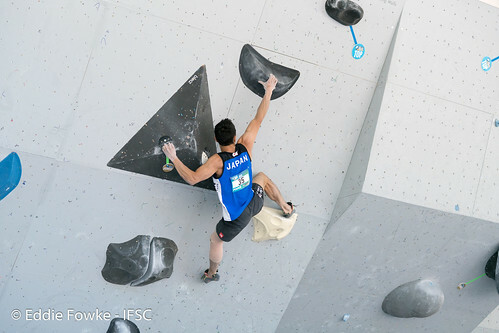 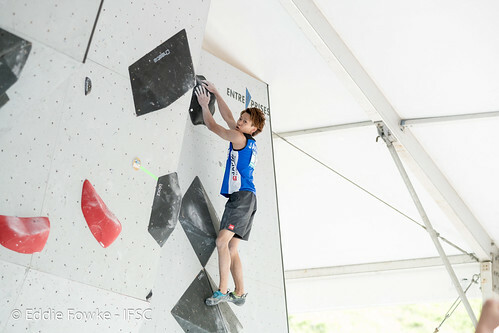 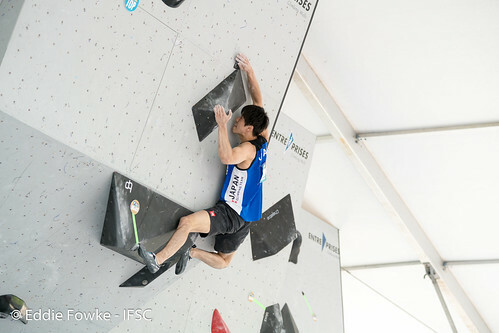 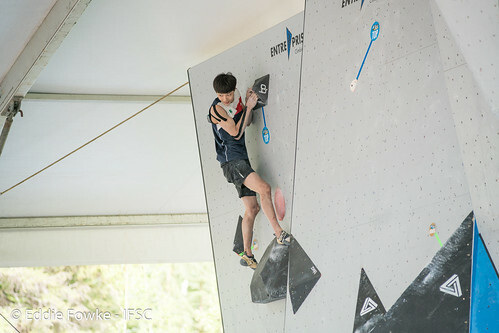 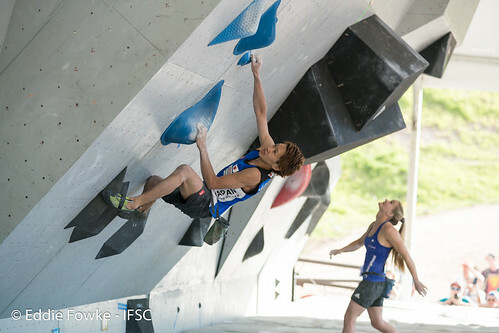 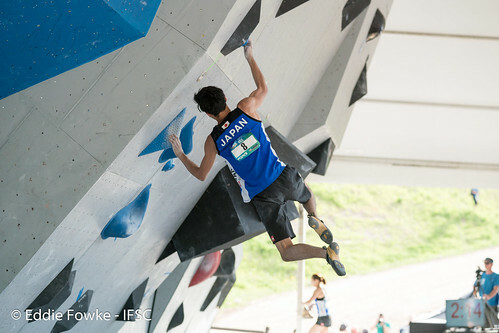 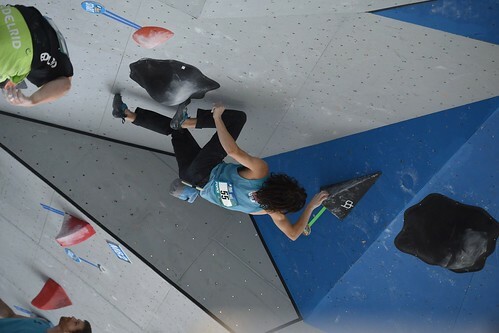 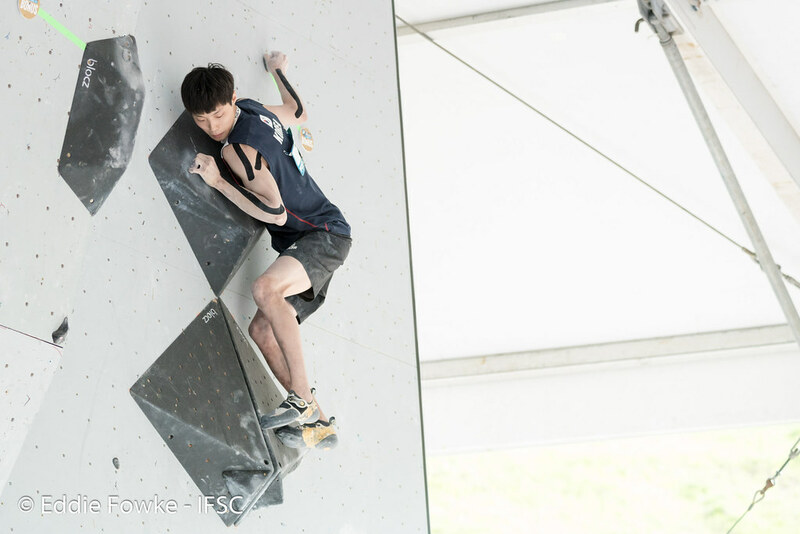 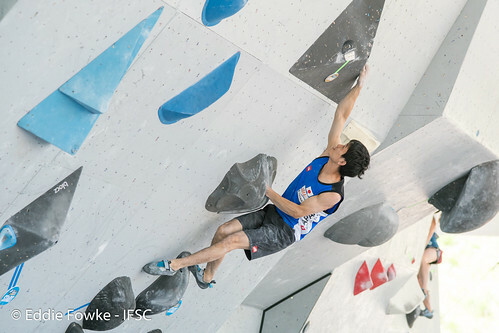 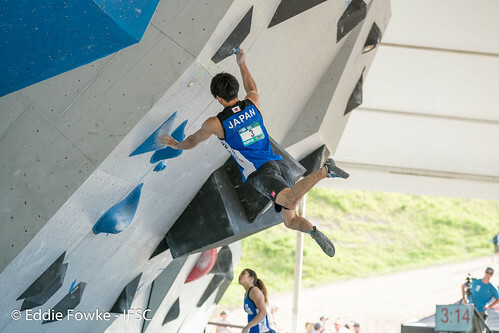 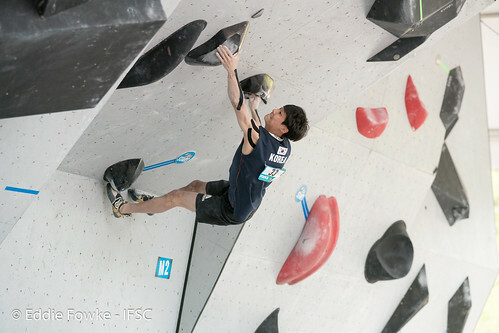 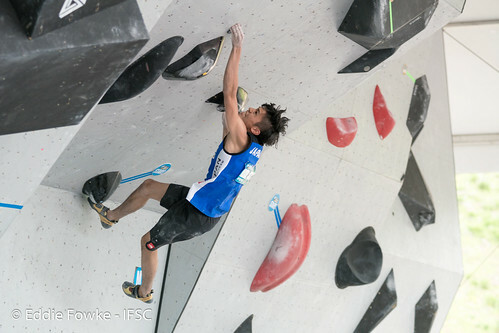 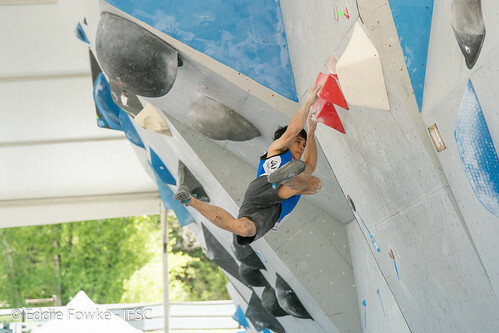 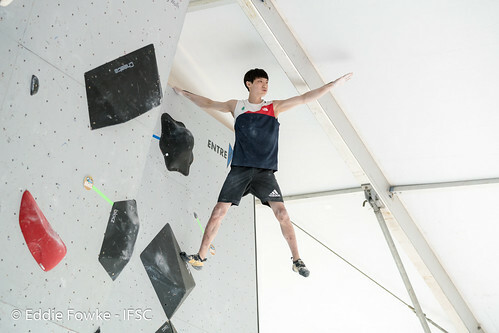 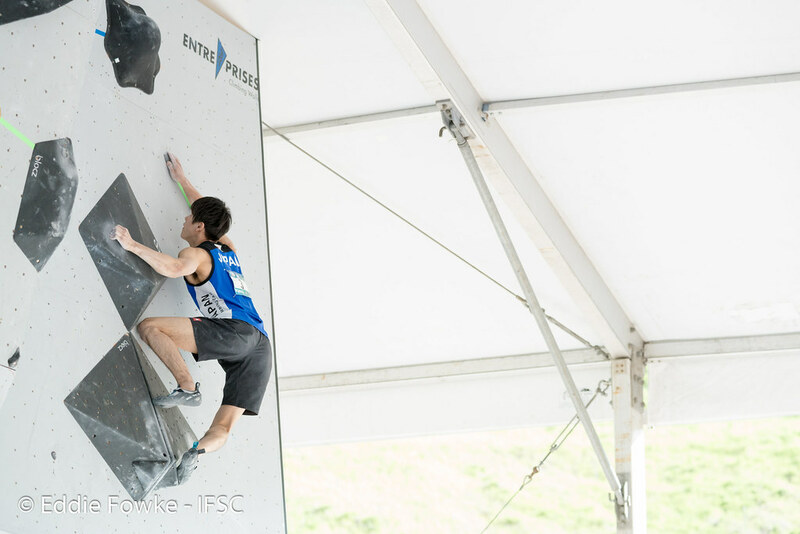 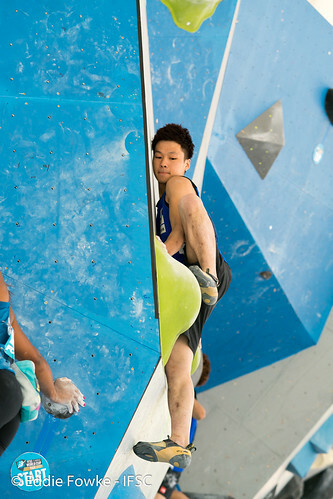 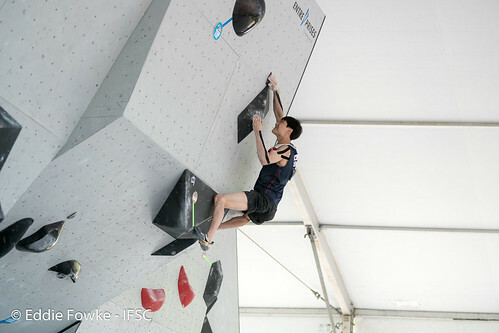 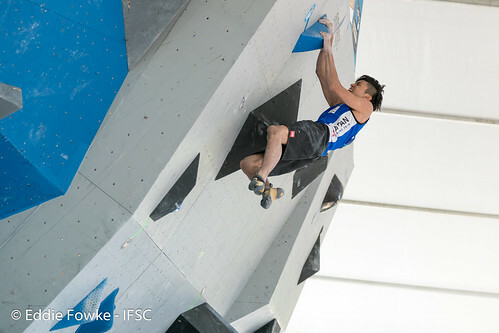 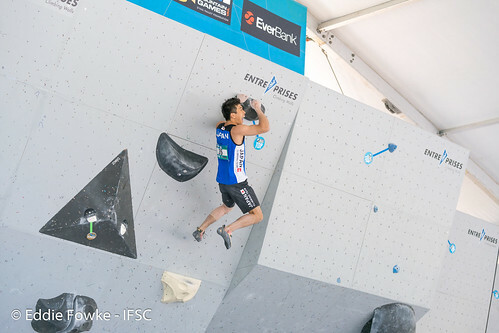 M2 was an exhausting overhang, and only Ogata’s teammate Kokoro Fujii and Jongwon Chon of Korea connected all the powerful moves. 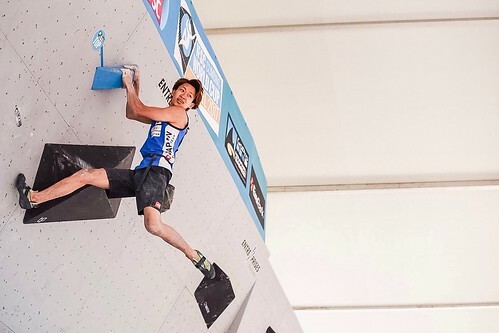 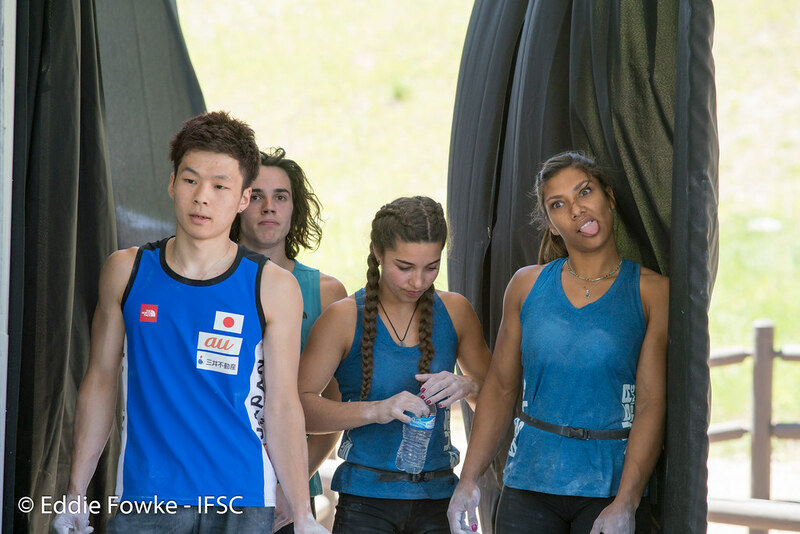 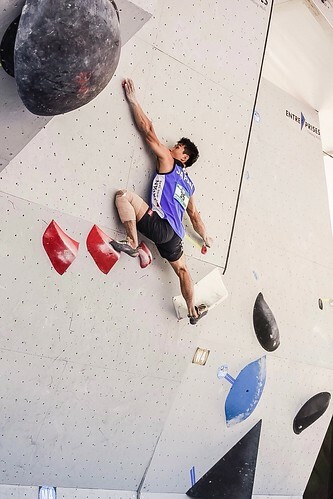 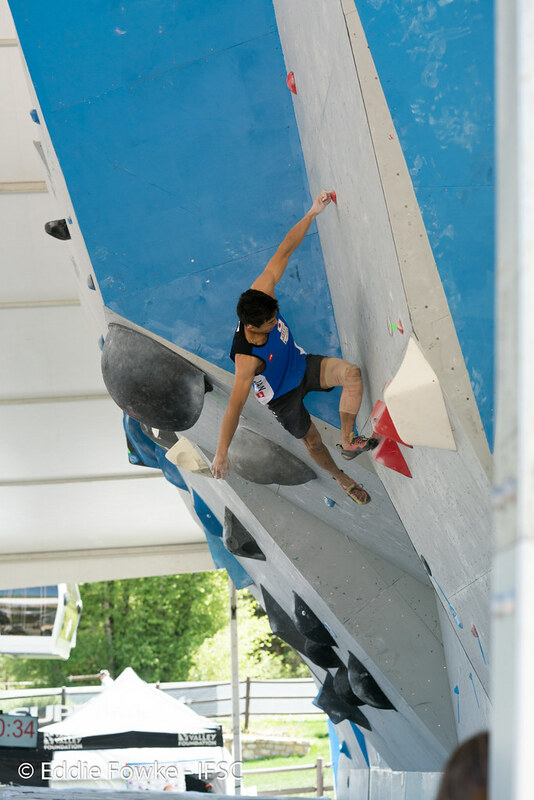 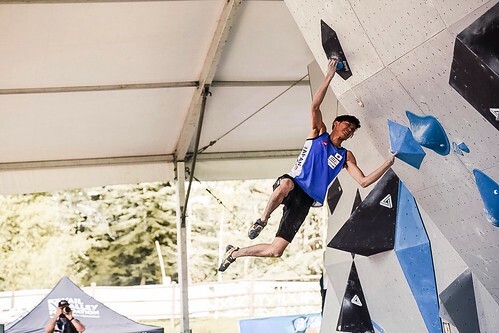 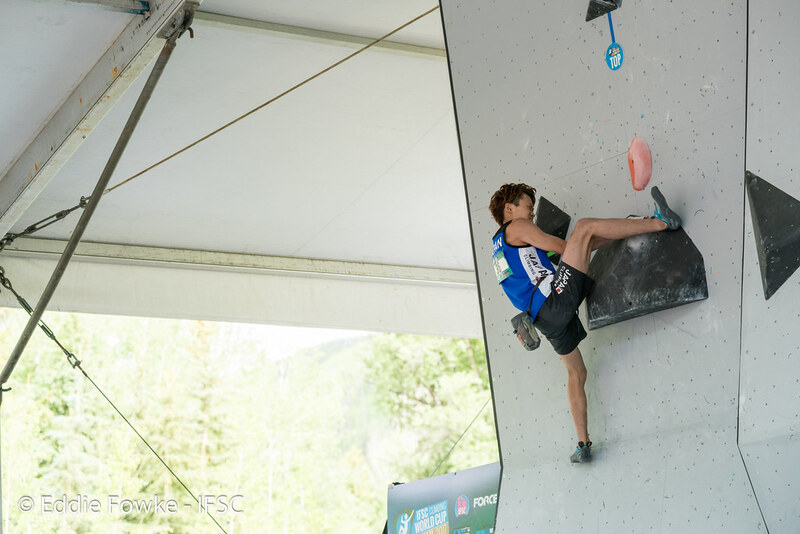 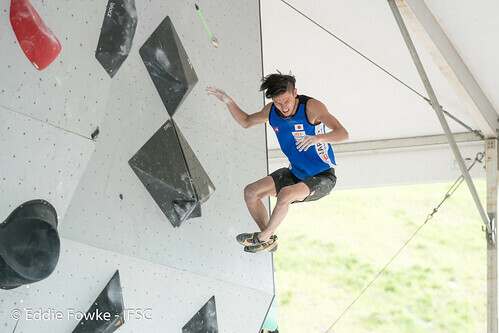 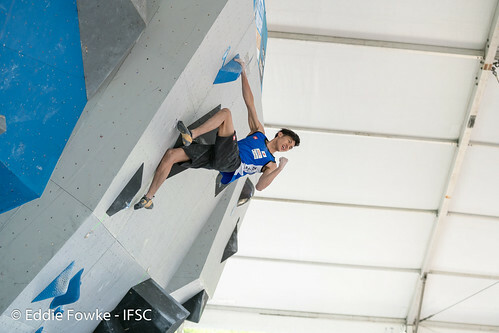 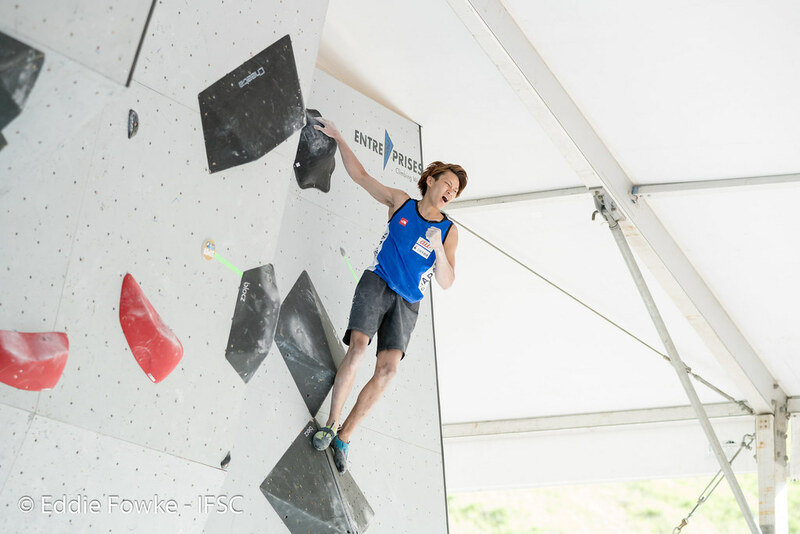 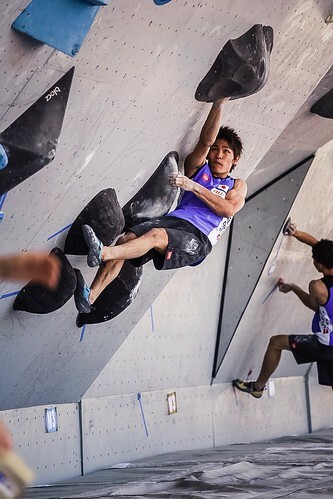 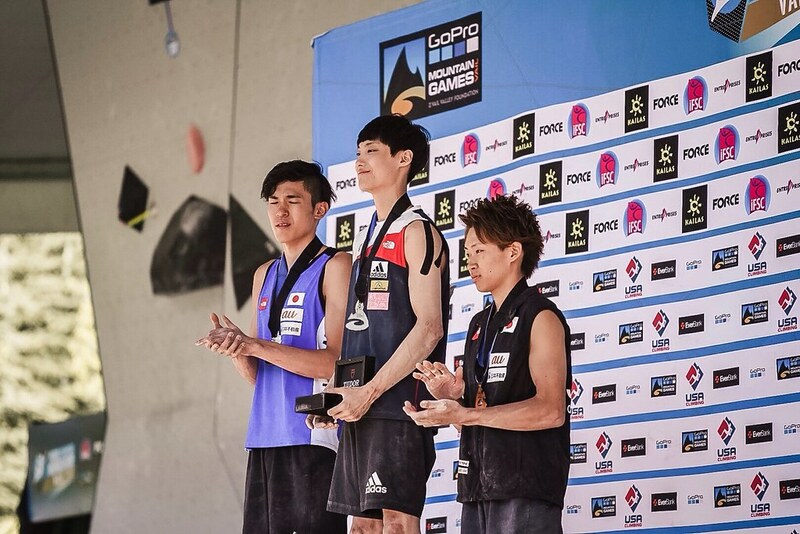 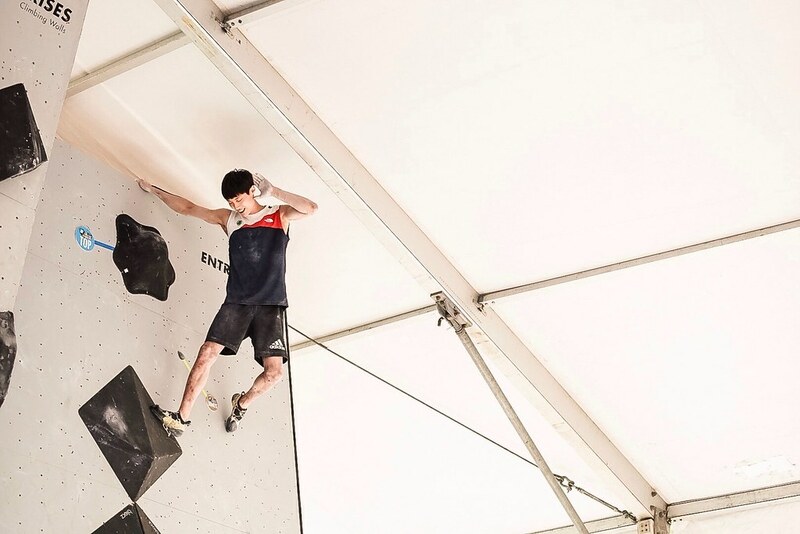 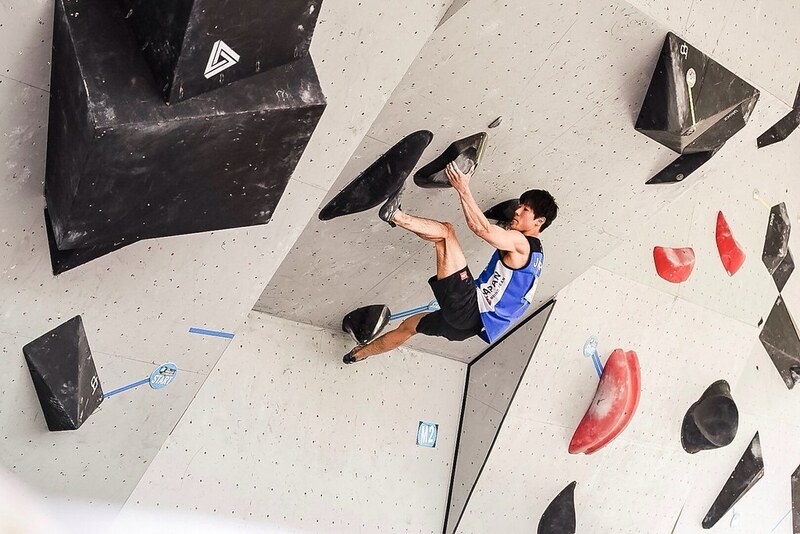 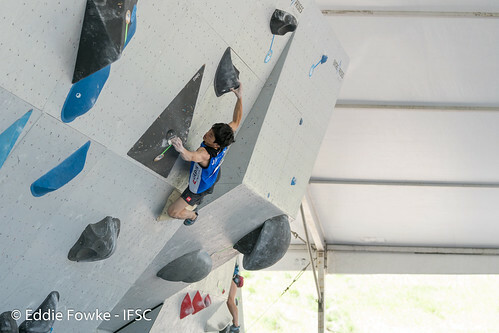 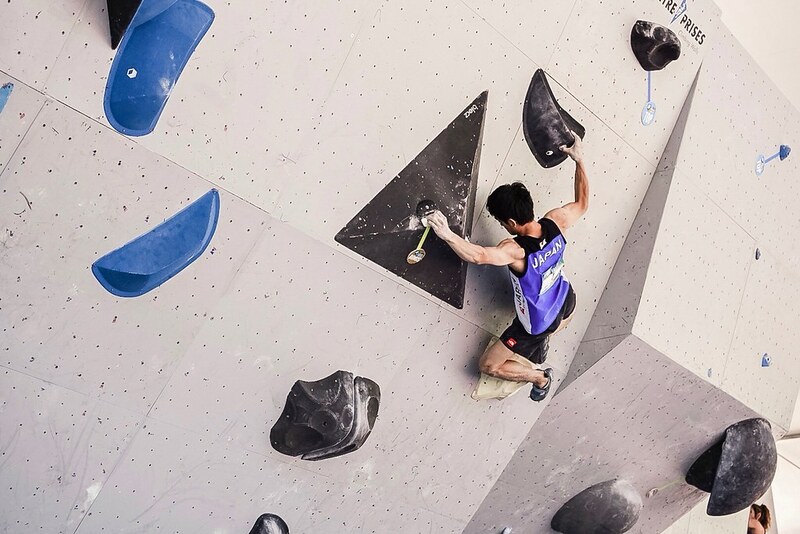 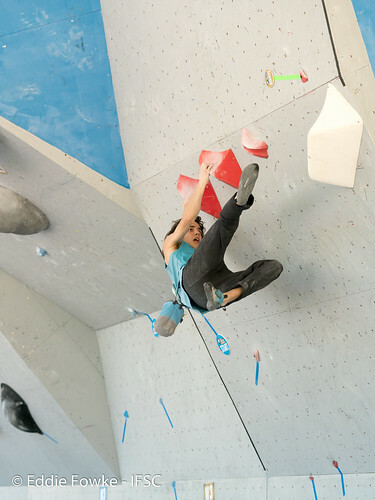 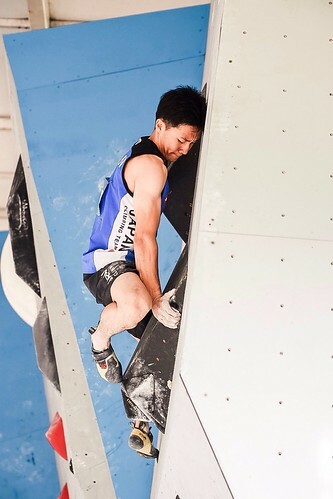 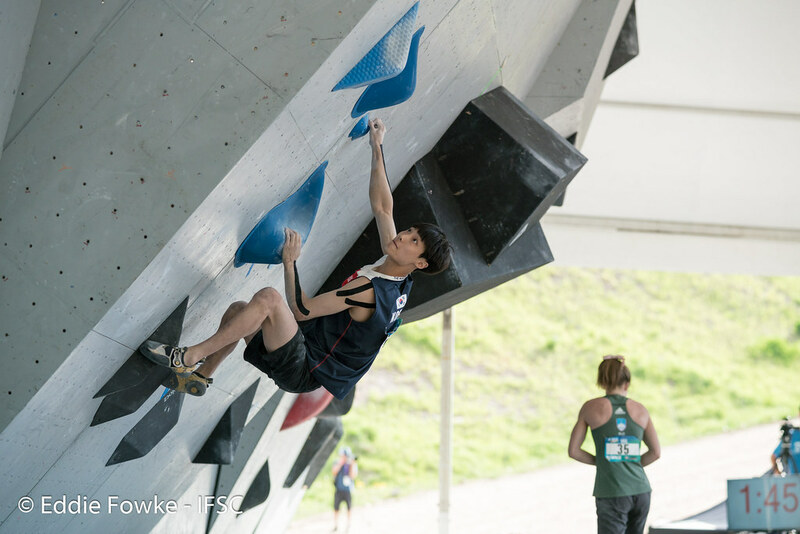 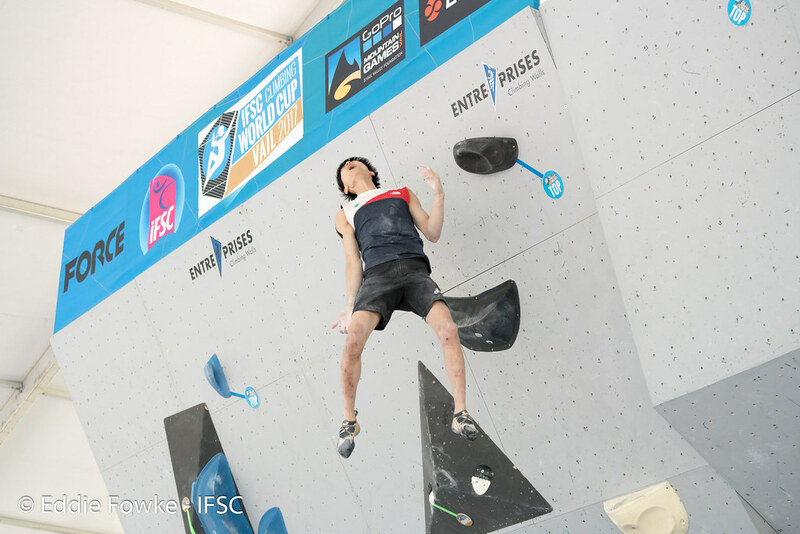 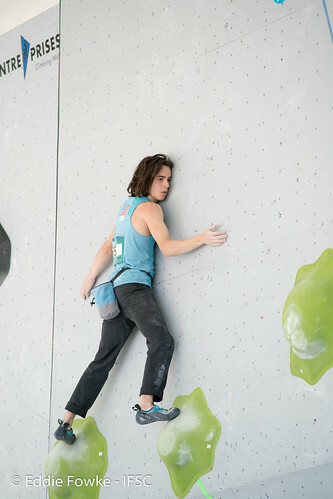 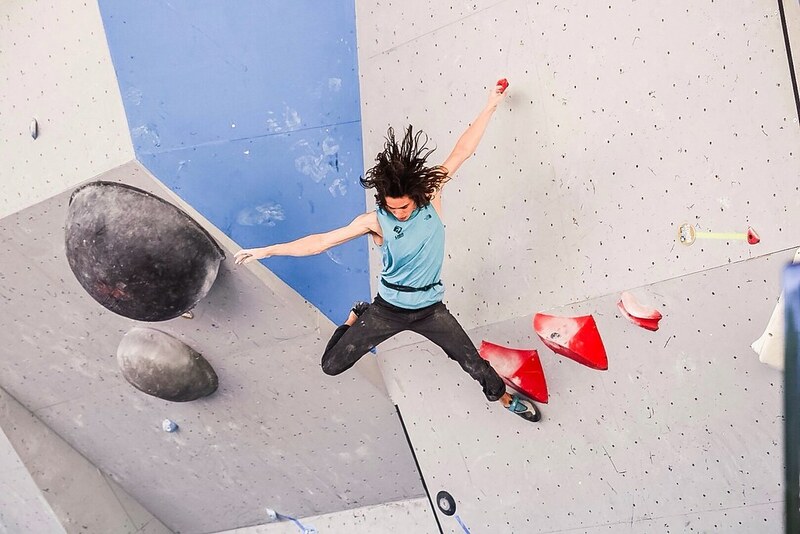 Chon took the lead with a top of the technical M3 slab, and Russian Aleksei Rubtsov and Meichi Narasaki of Japan entered the mix with tops of their own. 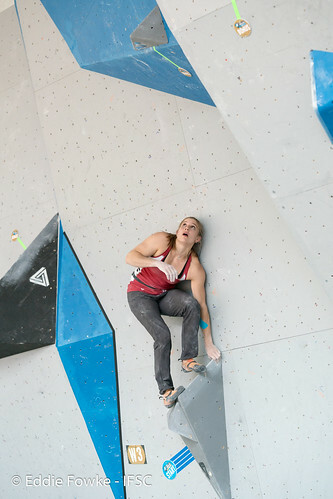 Like for the women, the medals came down to a final, demanding problem. 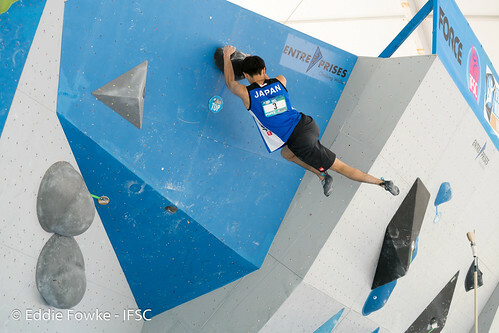 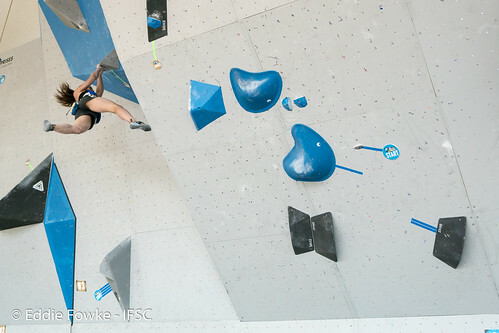 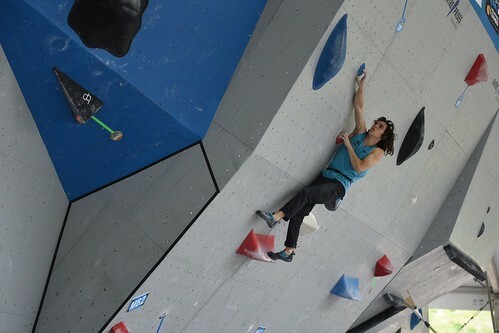 Narasaki and Ogata powered through the slippery features on another overhang for second and third place, respectively. 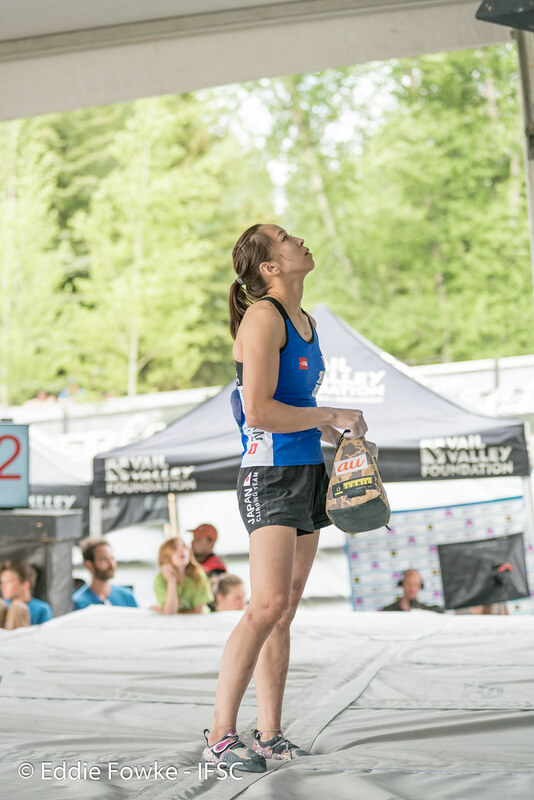 Chon made it a clean sweep of finals for the victory at Vail and soared in the season rankings. Rubtsov finished in 4th place ahead of Fujii by one attempt.